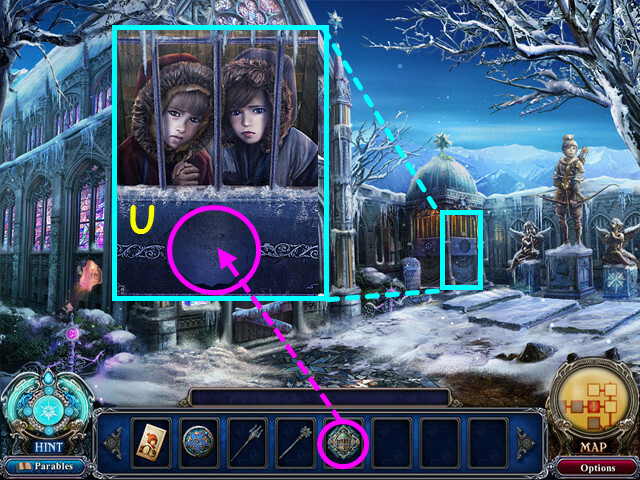 This document contains a complete Dark Parables: Rise of the Snow Queen game walkthrough featuring annotated screenshots from actual gameplay! 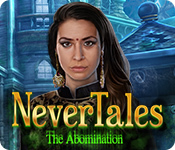 Select the ‘Parables’ button to track your progress on collecting the parable gems and read the stories of those you have complete collections (A). 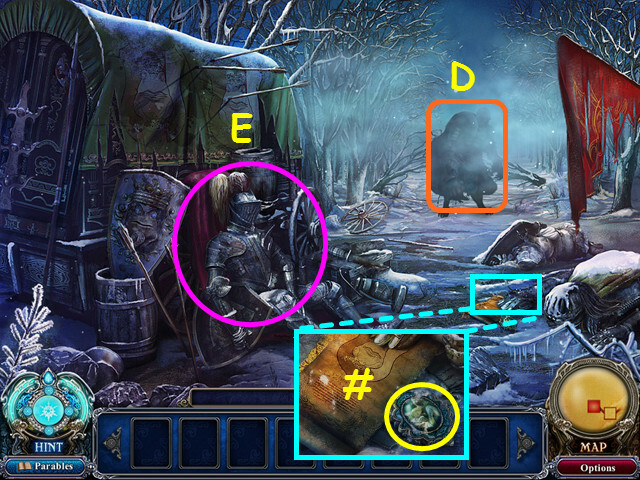 Hints are unlimited, but you must wait for the hint meter to recharge (B). 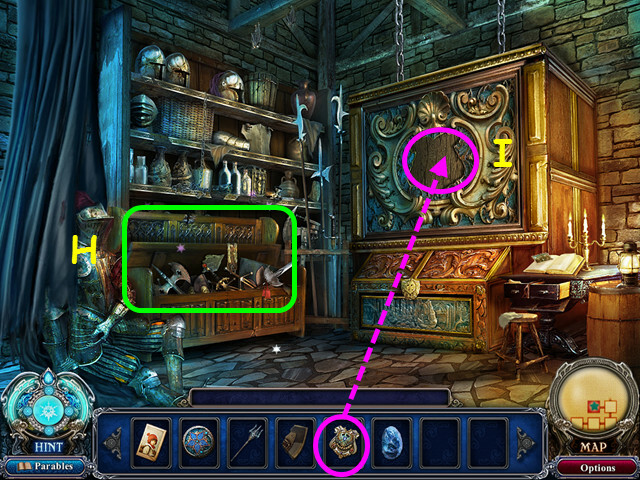 Your inventory is in the bottom panel – click on an item to select it for use (C). Select the map button to see your current location and current objective (D). 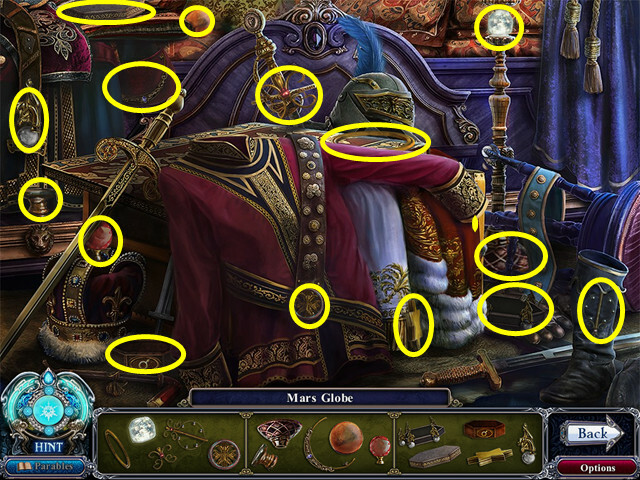 Blue stars on the map indicate that there is something available to do and white exclamation points show where an objective is located. You will have the option of a brief tutorial. Talk to the guide (A). Look in the case and take the DYNAMITE (B). Use the DYNAMITE in the hole on the blocked pass (C). Look at the beastly figure (D). 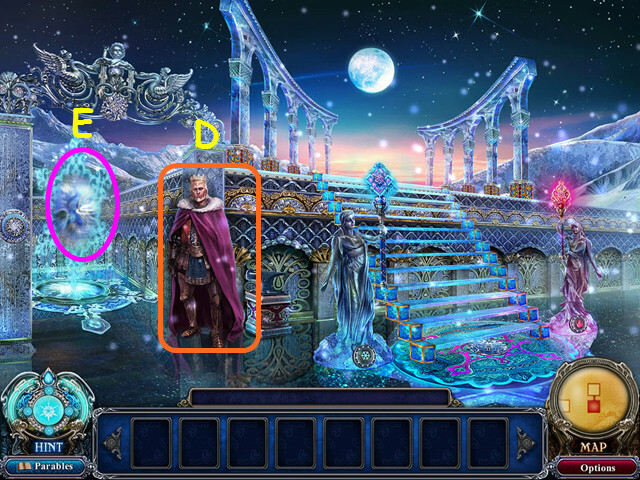 Look at the fallen knight on the right and take the 1/6 RISE of the SNOW QUEEN PARABLE GEM (#). Select the fallen knight on the left for a HOS (E). 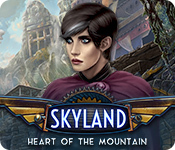 You will earn the MOUNTAIN KINGDOM EMBLEM. Place the MOUNTAIN KINGDOM EMBLEM on the gate (F). The guide will give you a PICTURE of the GUIDE’S SON, KAI. 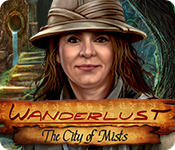 Look at the cross at the base of the statue on the right for a mini-game. 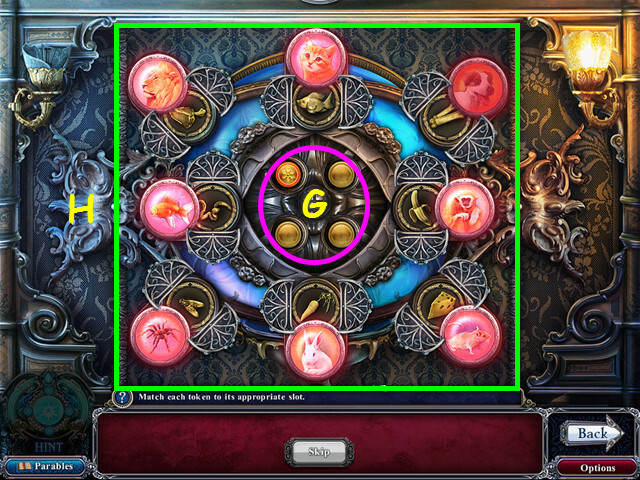 Use the 3 red buttons (G-I) to rotate the animal discs so they are in their normal habitats. The discs will light up when correct; note that some will work in more than one area. Select the following buttons: I-G-H-G-H-I. Take the STAR INSIGNIA from inside the panel. Try to talk to the girl (J). Take the 1/3 MOUNTAIN BEAST PARABLE GEM (#). 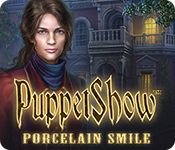 Select the sword of the statue as 1/20 Cursed Objects (@). Select the base of the statue for a HOS (K). You will earn the ORNAMENTAL TRIDENT. Walk through the gates on the left to the graveyard. 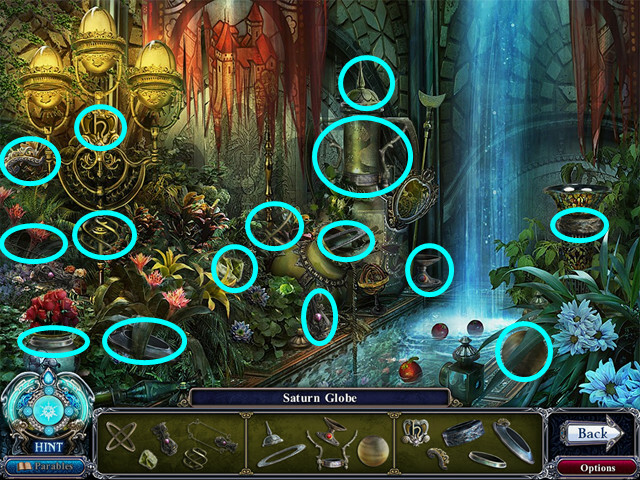 Look at the small right statue and take the ARMORY KEY (L). Talk to the children in the shed (M). Walk down, then go up to the right to the palace entrance. Look at the bird, then the Snow Queen (N). Look at the armory door and use the ARMORY KEY on the lock (O). 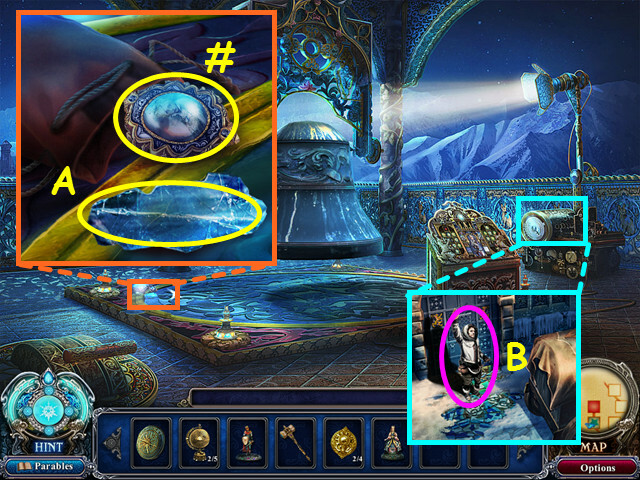 Select the statue on the right for a mini-game (P). 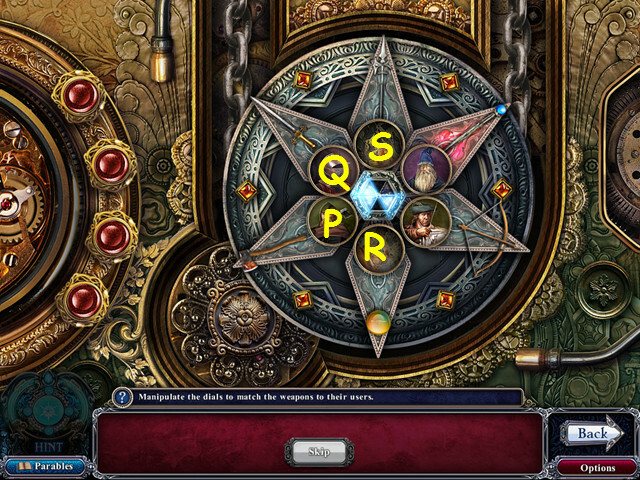 Press the buttons to make a path from the left (Q) to the right (R), using the exact number of each colored token shown at the top (S). A check mark will appear when you have used all the tokens of a color, an ‘X’ means you have used too many. Take the SNOW QUEEN’S WAND from behind the panel. 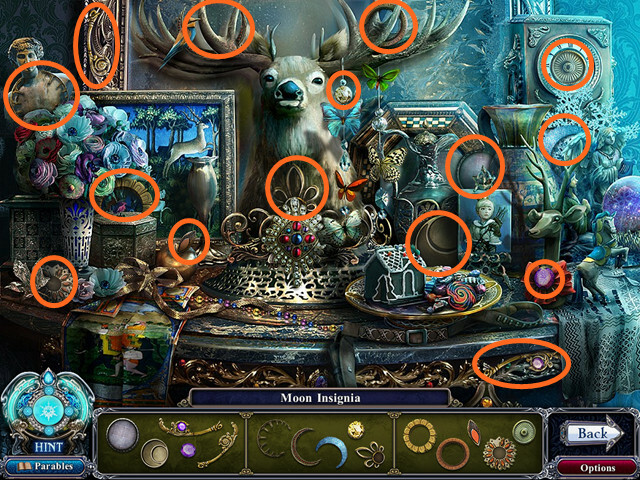 Look at the desk and take the 2/6 RISE of the SNOW QUEEN PARABLE GEM (#). Select the helmet as 2/20 Cursed Objects (@). 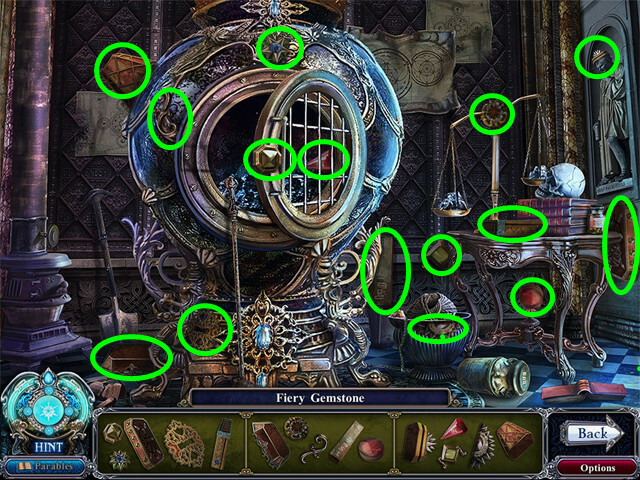 Select the chest for a HOS (T). You will earn the SHED EMBLEM. Look at the shed and place the SHED EMBLEM in the indentation (U). The children will give you the HERALDIC SHIELD PIECE. Return to the palace entrance. After the cut-scene, look at the fallen gargoyle (V). Take the 2/3 MOUNTAIN BEAST PARABLE GEM (#) and the APPLE KEY (W). Look at the corner of the building and use the APPLE KEY on the lock (X). 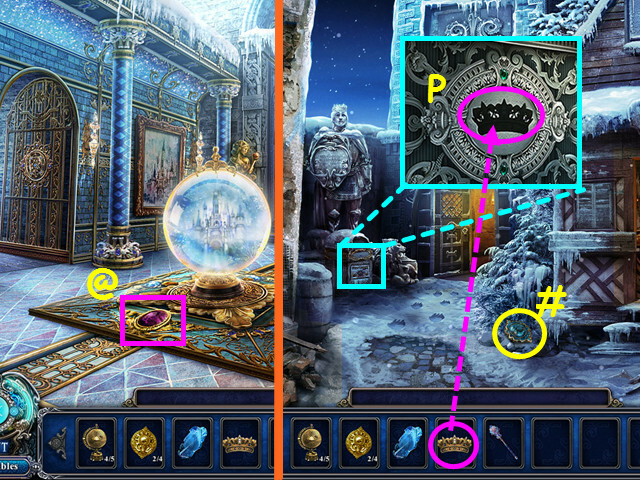 Take the SNOW QUEEN’S ORB from the compartment (Y). Walk down twice to the passage with the King and Queen statues. 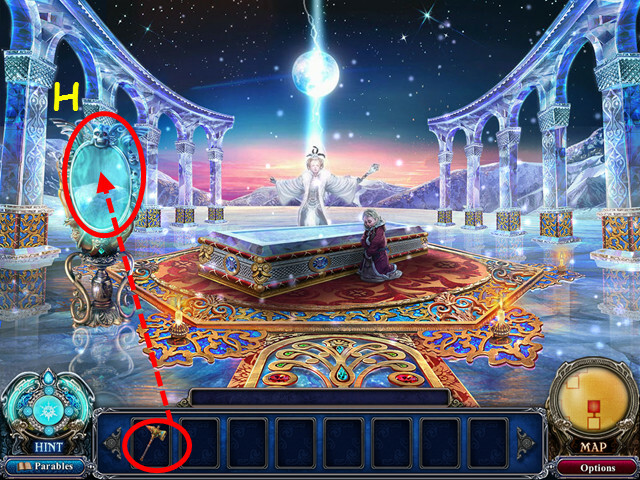 Place the SNOW QUEEN’S ORB into the right hand of the statue (A). 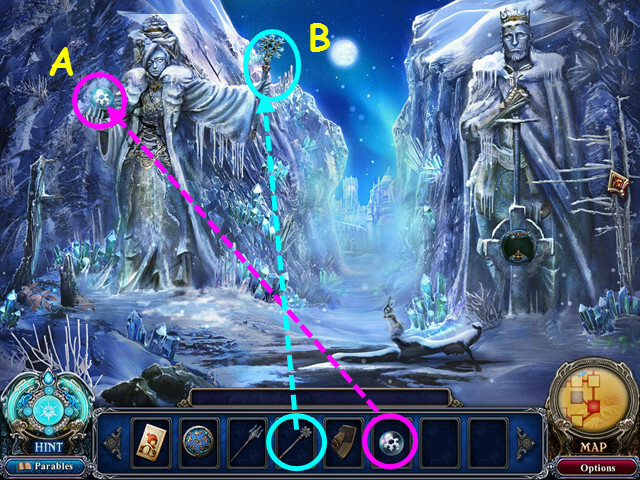 Place the SNOW QUEEN’S WAND into the left hand of the statue (B). Enter the cave that was hidden behind the statue. 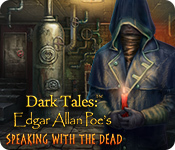 Look at the tombstone and take the 1/4 TALE of the TWO MIRRORS PARABLE GEM (#). Click on the axe handle (C) to break it off; take the METAL PRYING ROD (D). Note the fire pit (E). 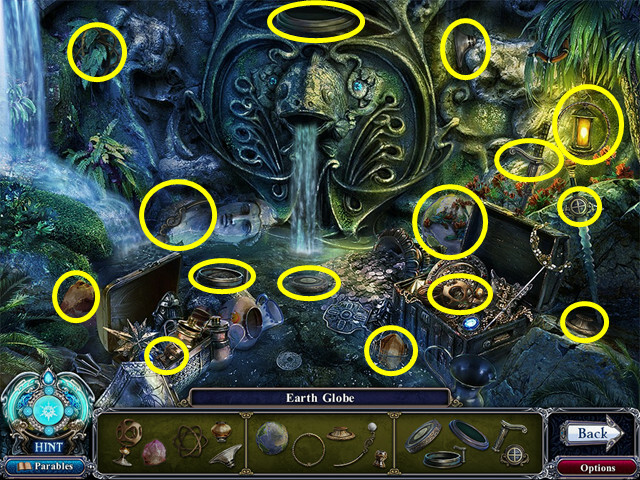 Select the fountain for a HOS (F). You will earn the EAGLE SHIELD. Use the METAL PRYING ROD to remove the boards on the door (F). Open the door and enter the crypt. 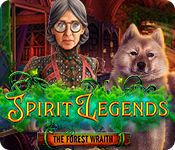 Select the stained glass on the left as the 3/20 Cursed Objects (@). 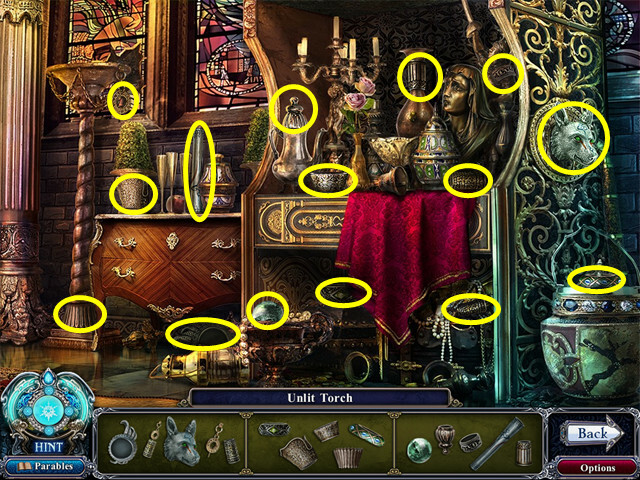 Select the cabinet on the right for a HOS (G). You will earn the UNLIT TORCH. Return to the cave; use the UNLIT TORCH on the fire to get the BURNING TORCH. Travel to the palace entrance. Use the BURNING TORCH on the frost wolf and you will earn the FROST STONE. Walk left to the armory. Note the chest on the left (H). Place the EAGLE SHIELD into the indentation (I). 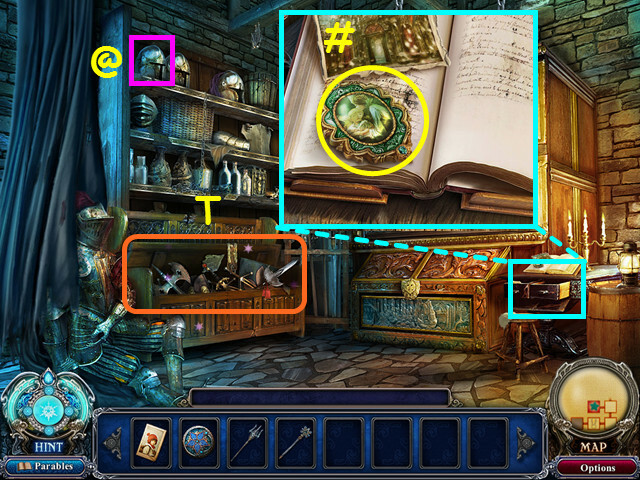 Look inside the cabinet for a mini-game. 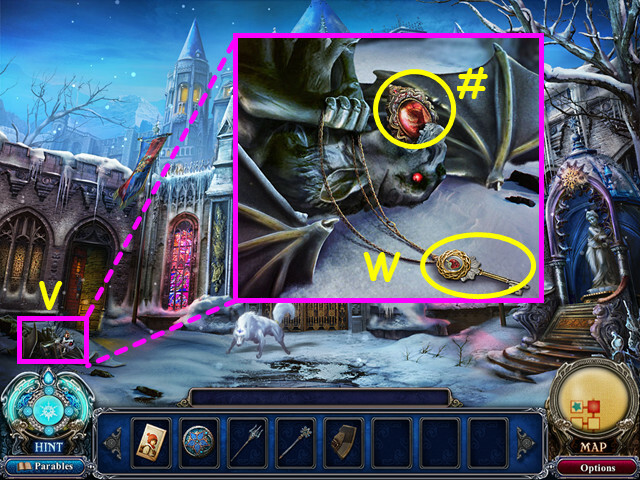 Use the red buttons (J) to move the dragon to the castle (K) and the eagle to the aerie (L). Each button may affect one or both animals. 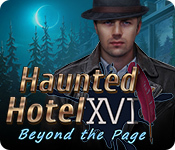 Press the following buttons: O x 4, N x 1, and M x 8. Press the center buttons to move the appropriate tool to each person. Press the woodsman (P) 3 times, the press the knight (Q) 3 times. 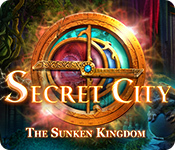 Press the bottom button (R) 3 times, then the upper button (S) 3 times. Select the chest on the left for a HOS. You will earn the CRYSTAL COIN. Exit to the palace entrance. 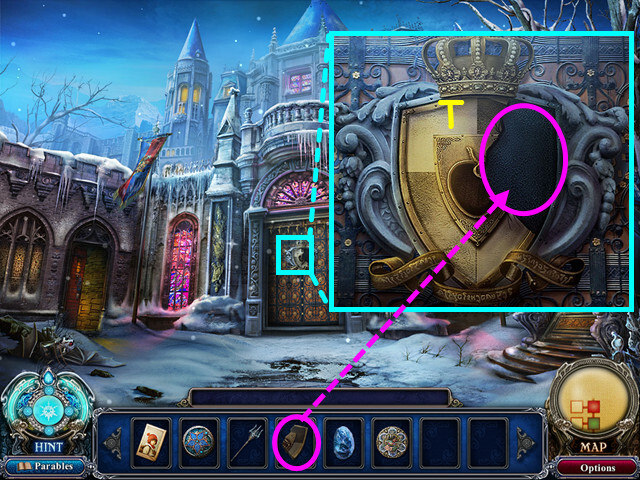 Look at the gate and place the HERALDIC SHIELD PIECE into the shield (T). Walk forward to enter the palace. Note the bronze gate (A). Note the stairs to the upper level (B). Note the vase of flowers; this will become a Cursed Object shortly (@). Open the library door and go inside (C). 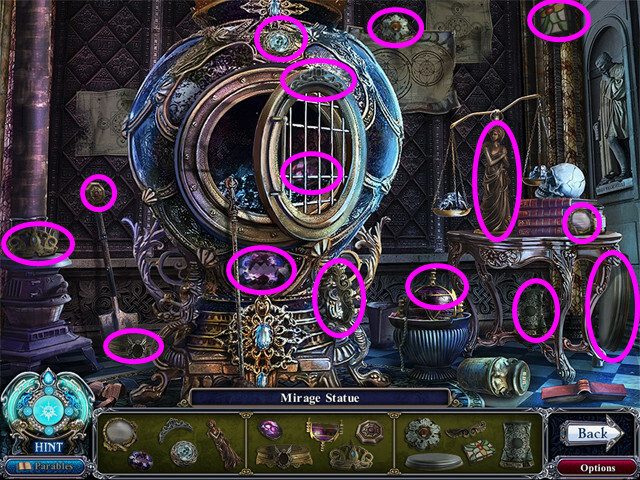 Note the glass case (D). 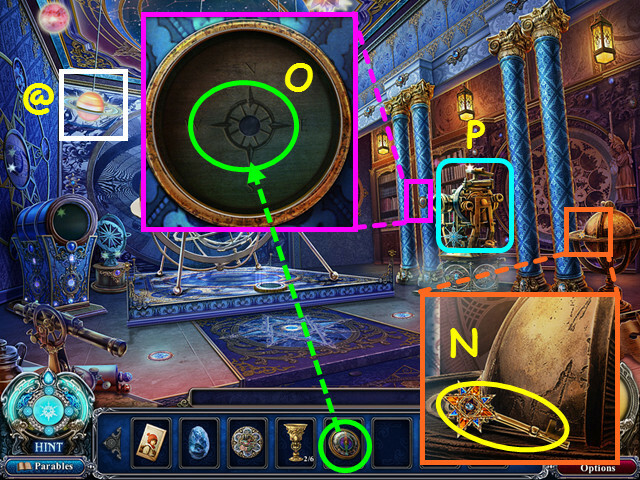 Look at the door and place the STAR INSIGNIA into the top portion (E). 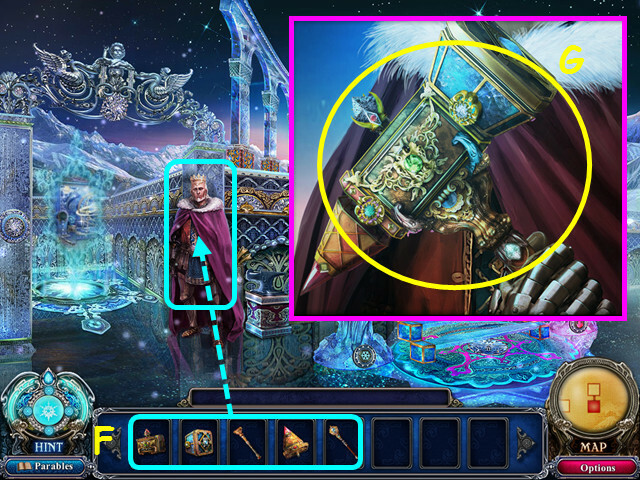 Place the ORNAMENTAL TRIDENT into the statue’s hand (F). 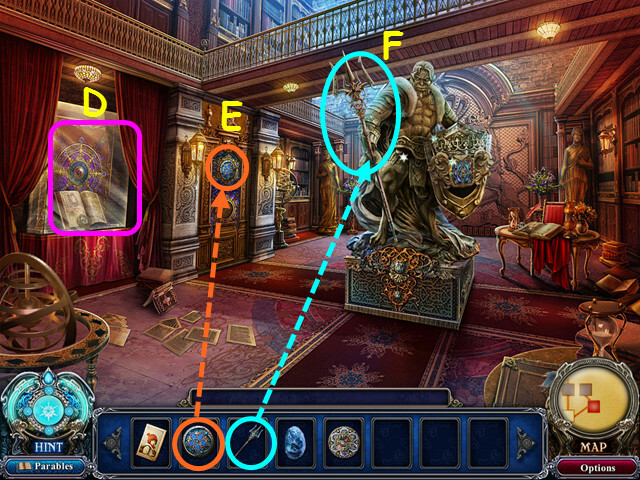 Select the statue for a mini-game. 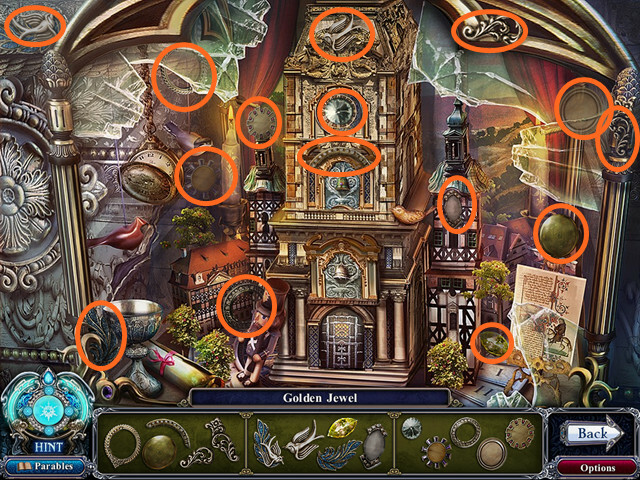 Press a gold button in the center (G) to open the 3 nearest circles; only 3 circles can be open at a time. Click on 2 foods to swap positions and move the foods to the correct animal; the animal will light up when correct. The solution is shown here with all the circles open (H). Press the button that appears. Select the vase of flowers by the library door as the 4/20 Cursed Object. Walk up the stairs then try to walk forward. 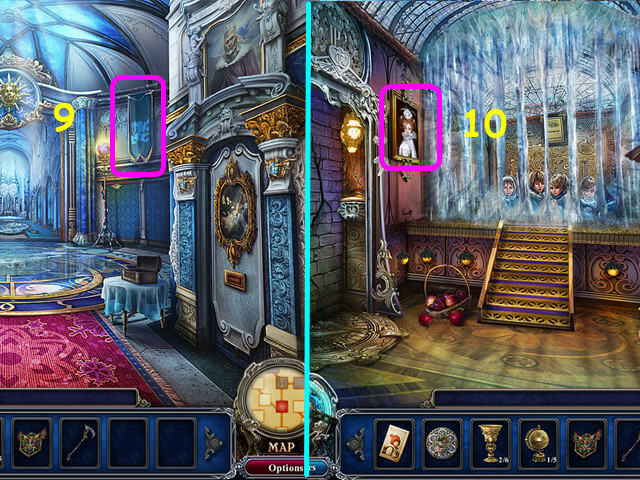 Look at the picture on the right and take the 3/6 RISE of the SNOW QUEEN PARABLE GEM (#). 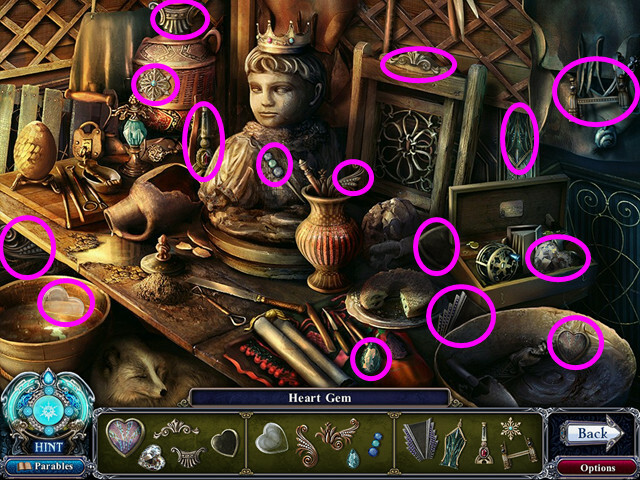 Open the small chest and take the 1/6 GOBLET COLLECTION (I). Select the table for a HOS (J). You will earn the MOON INSIGNIA. Walk left to the balcony. Talk to Gerda and she will give you the GOLDEN COMPASS (K). Take the 2/6 GOBLET COLLECTION (L). Take the 3/3 MOUNTAIN BEAST PARABLE GEM from the statue’s hand (#). Look at the door and place the MOON INSIGNIA into the lower portion (M). Select the planet as the 5/20 Cursed Object (@). 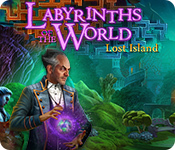 Look at the globe and take the WORKSHOP KEY (N). 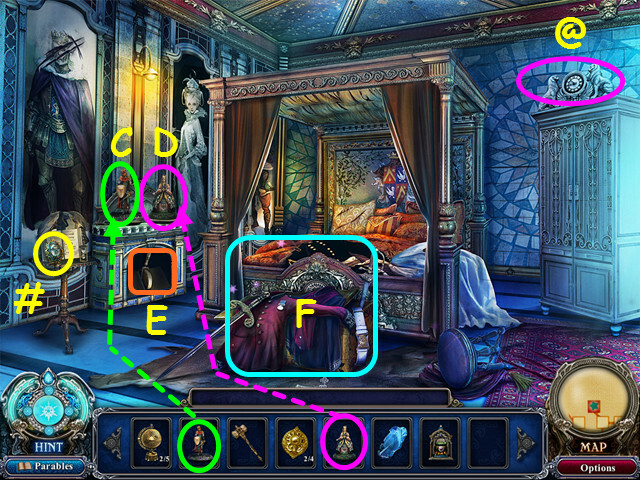 Look at the column and place the GOLDEN COMPASS into the circle (O). Select the mechanism for a HOS (P). You will earn the GILDED APPLE. Show the GILDED APPLE to Gerda (Q). 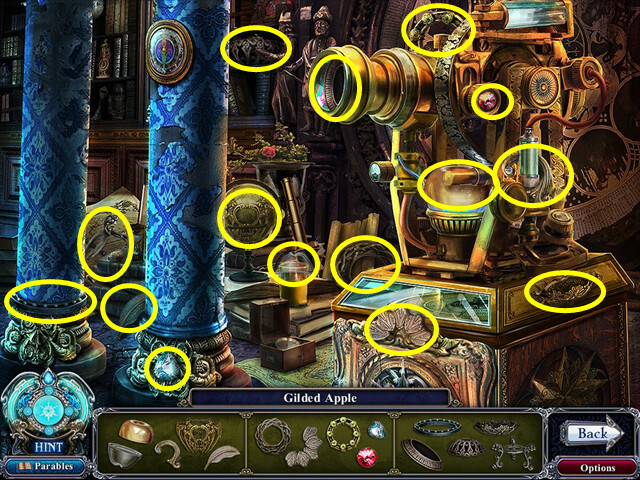 Look at the stand and place the GILDED APPLE on it (R). Walk left to the apple room. Select the top center of the left stained glass for the 6/20 Cursed Object (*). 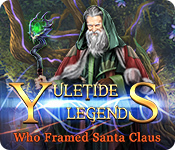 Look at the portrait and take the 1/3 GOLDEN CHILD PARABLE GEM (#). 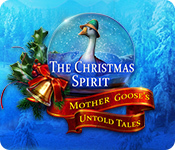 Take the 4/6 RISE of the SNOW QUEEN PARABLE GEM (@). Try to open the door at the rear (S). Select the flowers for a HOS (T). You will earn the BRONZE SHIELD. Return to the main hall with the snow globe. Use the BRONZE SHIELD on the bronze gate to the left. 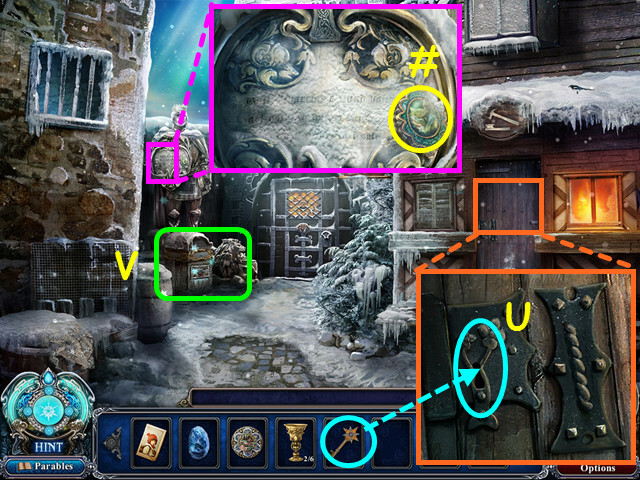 Look at the door and use the WORKSHOP KEY on the lock (U). 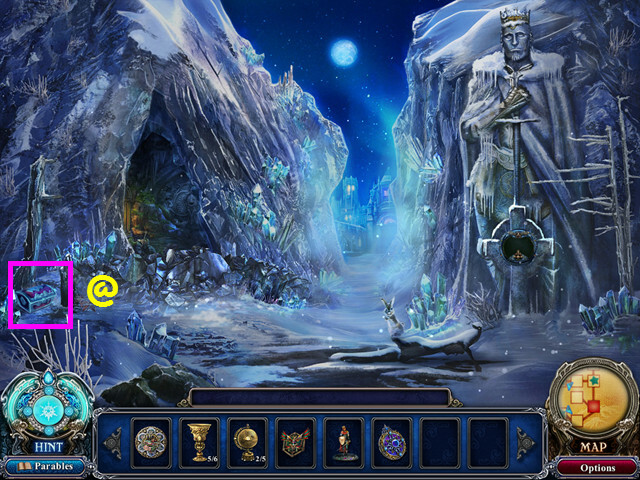 Look at the statue’s shield and take the 5/6 RISE of the SNOW QUEEN PARABLE GEM (#). Note the base of the statue (V). Take the 1/5 GLOBE COLLECTION (W). Select the helmet as the 7/20 Cursed Object (@). 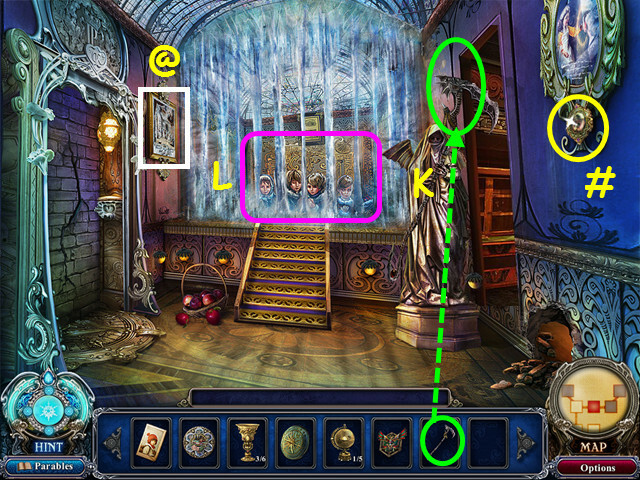 Look at the mirror and take the 2/4 TALE of the TWO MIRRORS PARABLE GEM (#). 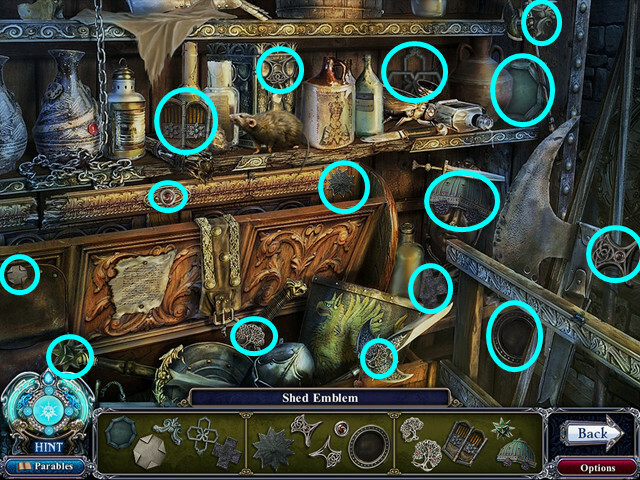 Select the workbench for a HOS (Y). You will earn the HEART GEM. 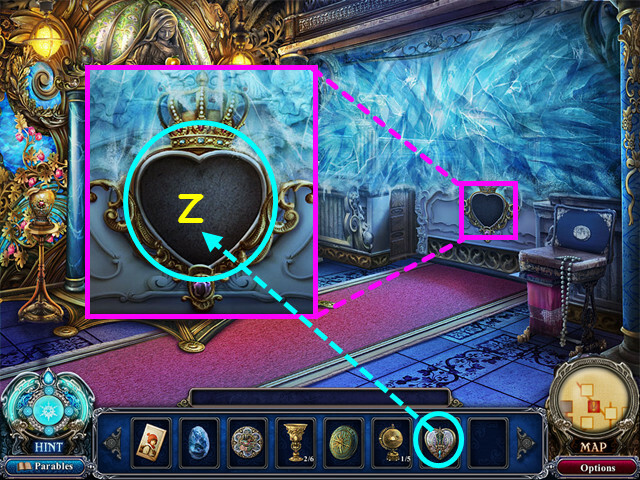 Look at the balcony wall and place the HEART GEM into the indentation (Z). 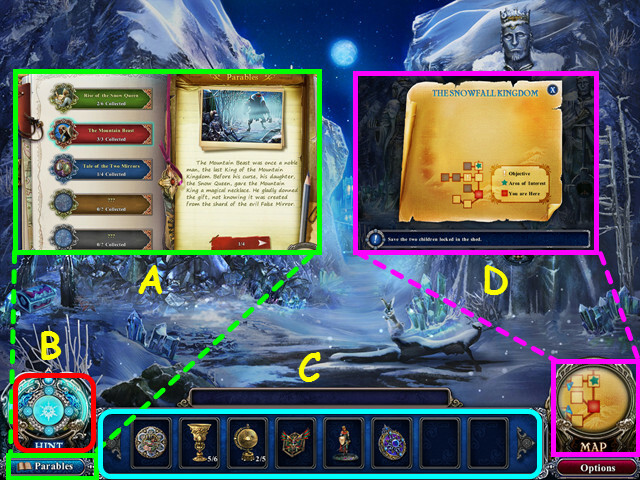 Look at the right side of the table and take the 6/6 RISE of the SNOW QUEEN PARABLE GEM (#). 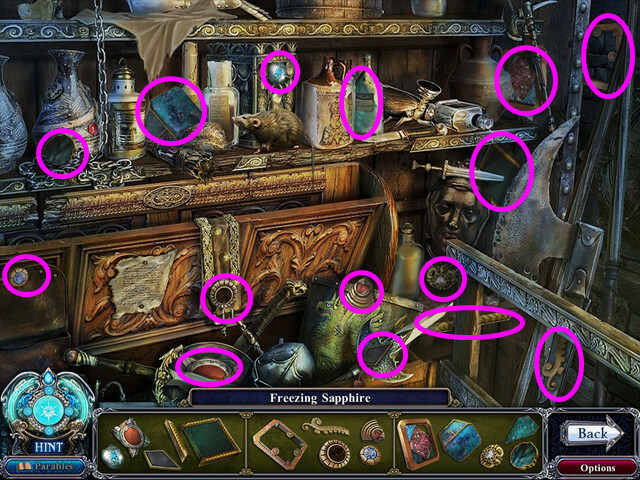 Look at the left side of the table and take the 1/6 SNOW QUEEN TALE PARABLE GEM (@). 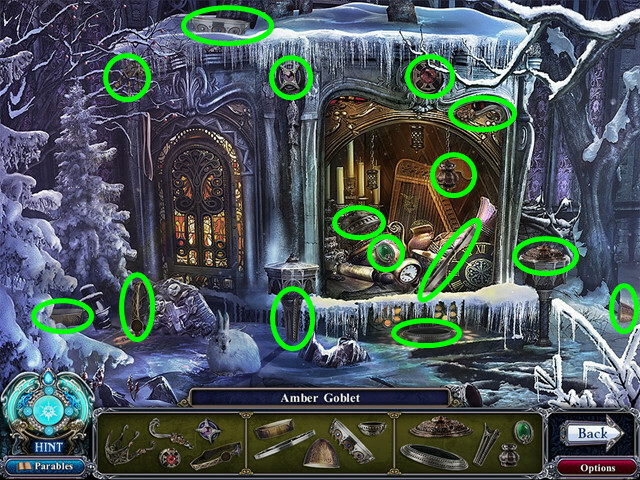 Open the drawer and take the SILVER ARROW (A). Select the skeleton for a HOS (B). You will earn the ROPE and HOOK. Select the graffiti as the 8/20 Cursed Object (@). Pull back the blanket, look at the bed and take the WATER VIAL (C). 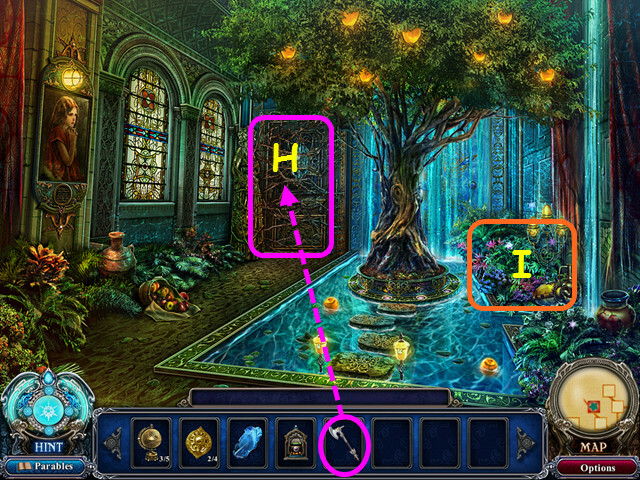 Look at the hole beneath the window, place the FROST STONE inside then use the WATER VIAL on the stone (D). Use the ROPE and HOOK on the window then exit the jail (E). Place the SILVER ARROW on the box to open it (F). Take the 3/6 GOBLET COLLECTION (G). Select the work area for a HOS (H). You will earn the PHOENIX PORTRAIT. Return to the main hall to learn the ice has melted. 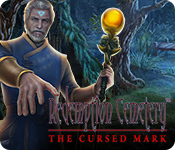 Select the banner as the 9/20 Cursed Objects (@). Select the table for a HOS (#). You will earn the SCYTHE. 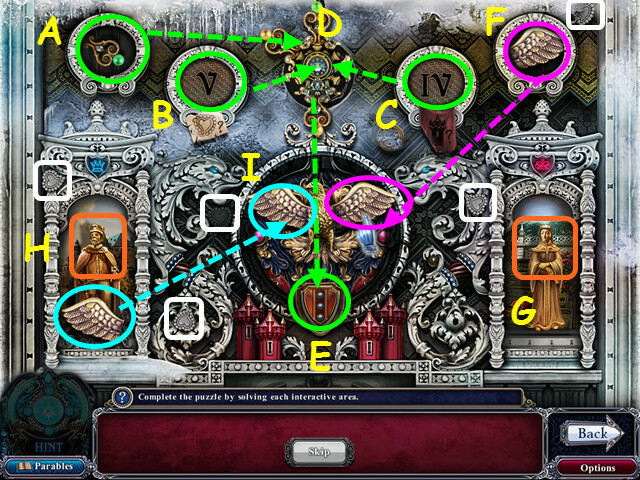 Walk forward and select the throne for a mini-game. Press a gold button in the center (I) to open the 3 nearest circles; only 3 circles can be open at a time. Click on 2 headgear to swap positions and move the headgear to the correct person; the person will light up when correct. The solution is shown here with all the circles open (J). Take the 2/3 GOLDEN CHILD PARABLE GEM (#). Give the SCYTHE to the statue (K). Talk to the children to get the 4/6 GOBLET COLLECTION (L). Select the painting as the 10/20 Cursed Object (@). 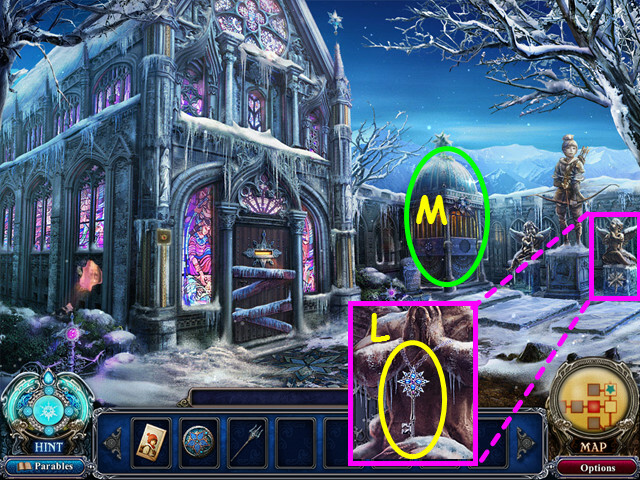 Note the door mini-game (B). Select the table for a HOS (C). You will earn the PRINCE FIGURINE. 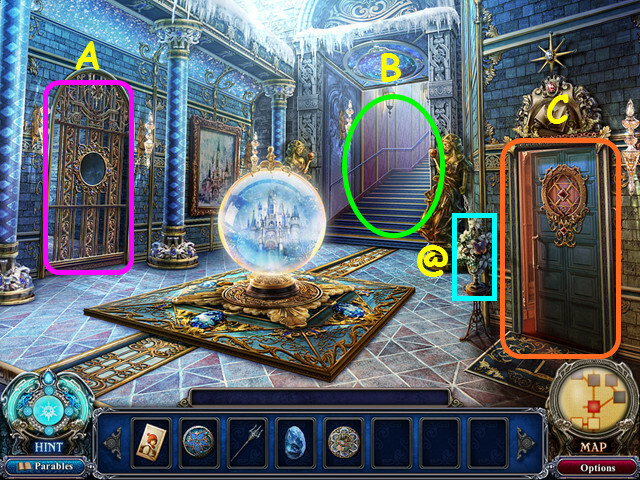 Select the door for a mini-game. 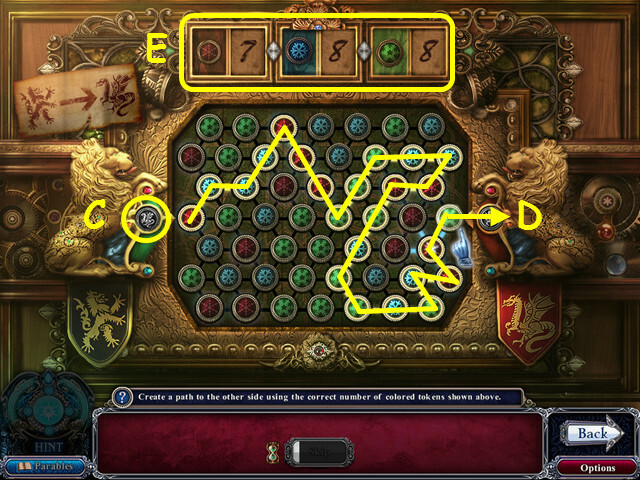 Press the buttons to make a path from the left (D) to the right (E), using the exact number of each colored token shown at the top (F). Press the button that appears, then walk forward. Take the 5/6 GOBLET COLLECTION (G). Select the shield as the 11/20 Cursed Object (@). 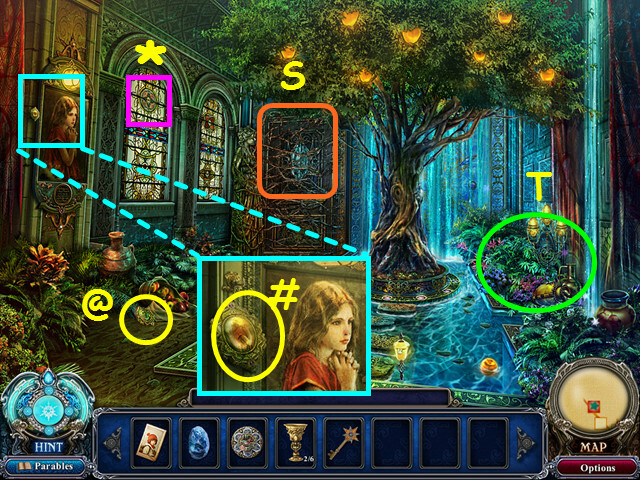 Look at the glass case and take the 3/4 TALE of the TWO MIRRORS PARABLE GEM (#). 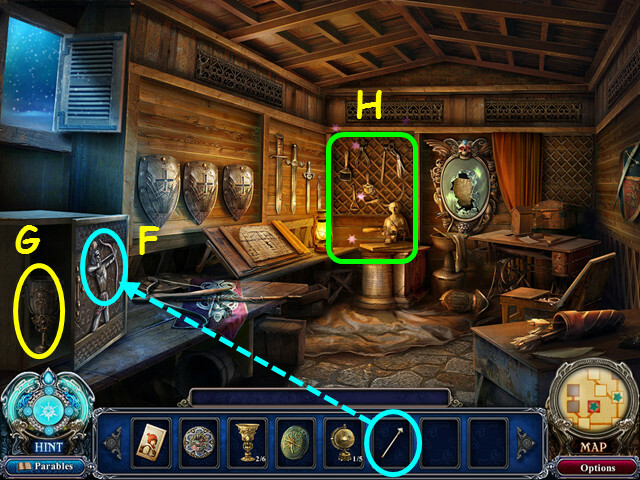 Exit the room, then select the device on the right for a mini-game. 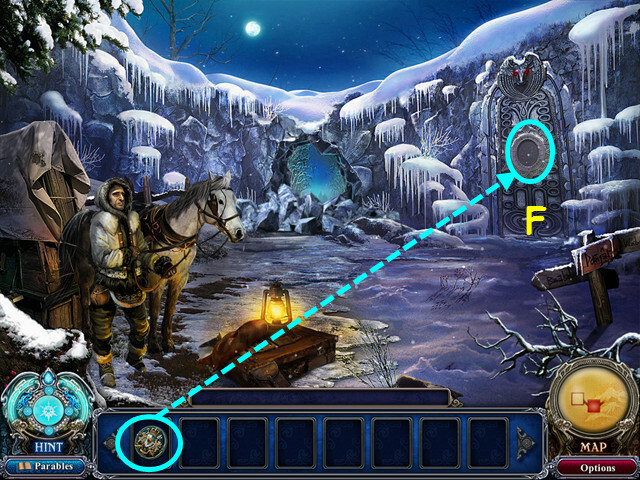 Click on the 2 wolf tails (I), then press the button that appears on the right (J). Click on the tiles to form the picture of the rose (K). 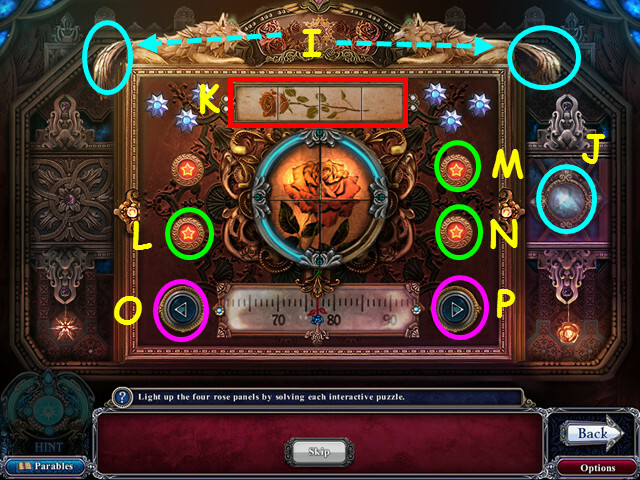 Use the 4 buttons to light the blue flowers- each button changes 4 flowers. Push buttons L, M, and N.
Use the buttons to move the flower to the center-line. Press P x 5, O x 5, and P x 4. Press the button that appears in the center. Give the PICTURE of the GUIDE’S SON, KAI to Kai (Q). Select the fountain for a HOS. You will earn the 2/5 GLOBE COLLECTION. Select the chest as the 12/20 Cursed Object (@). 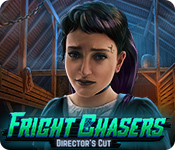 After the cut-scene, Kai will give you the SILVER PENDANT. Walk forward to the frog prince’s caravan on the misty trail.Select the shield on the left end of the wagon cover for the 13/20 Cursed Object (@). Walk forward and select the fallen knight on the left for a HOS. You will earn the HEAVY SLEDGEHAMMER. Walk down, go forward to the right then forward again. Select the statue base for a HOS. 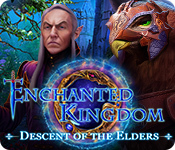 You will earn the 6/6 GOBLET COLLECTION. Select the star at the top of the shed for the 14/20 Cursed Object (@). Note the door on the left (A). Note the shelf on the right (B). 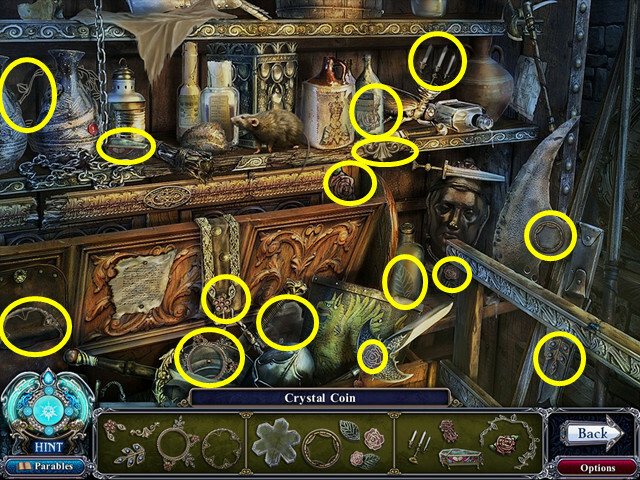 Look at the cabinet for a mini-game (C). 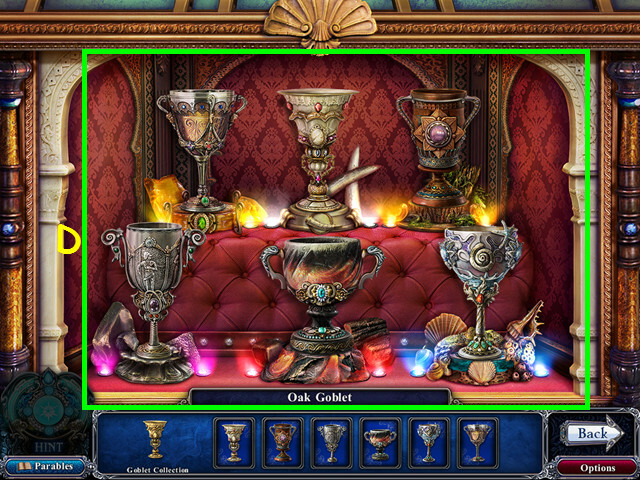 Place the goblets on the correct stand; click on two goblets to swap positions. 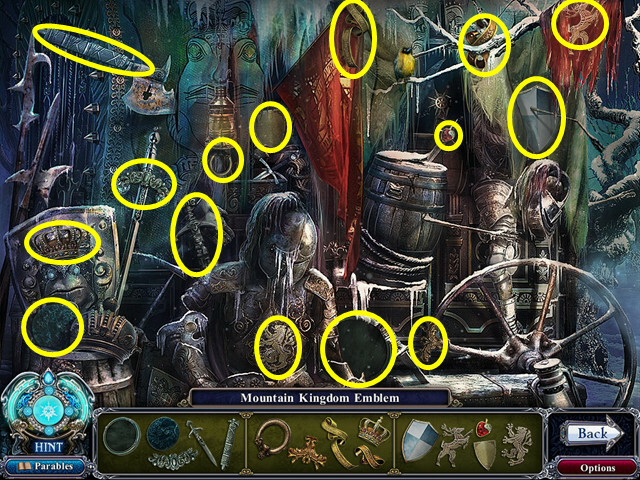 Hover your mouse over a goblet to see the name, then find the similarly themed base. The solution is shown here (D). Look at the shelf for a HOS. You will earn the TOWER KEY. 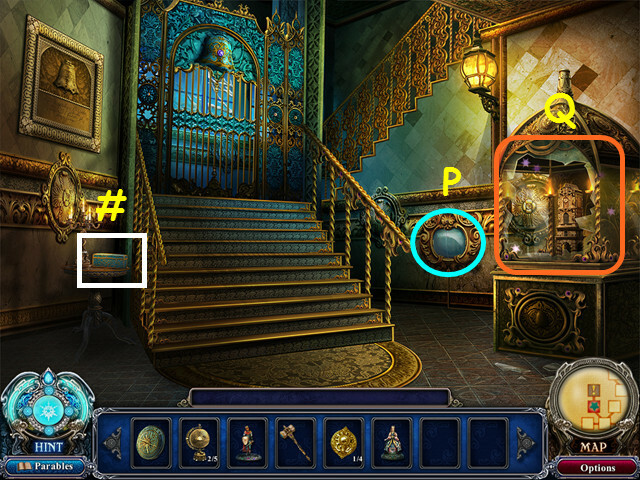 Look at the left door for a mini-game. 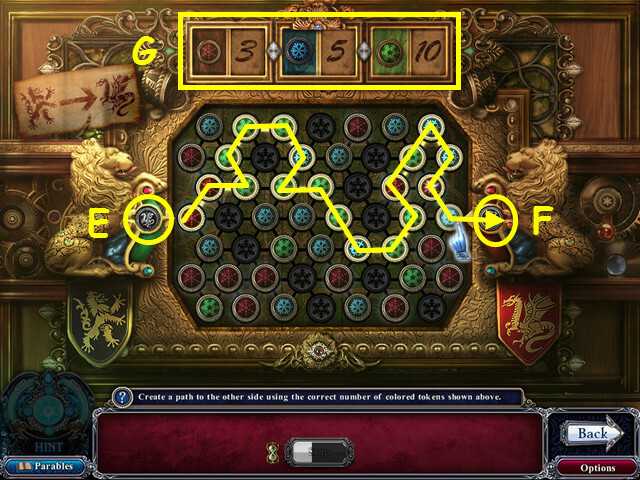 Press the buttons to make a path from the left (E) to the right (F), using the exact number of each colored token shown at the top (G). Walk left to enter the shrine. Look at the boy’s portrait; take the 3/3 GOLDEN CHILD PARABLE GEM (#). Place the PHOENIX PORTRAIT on the back wall (H). 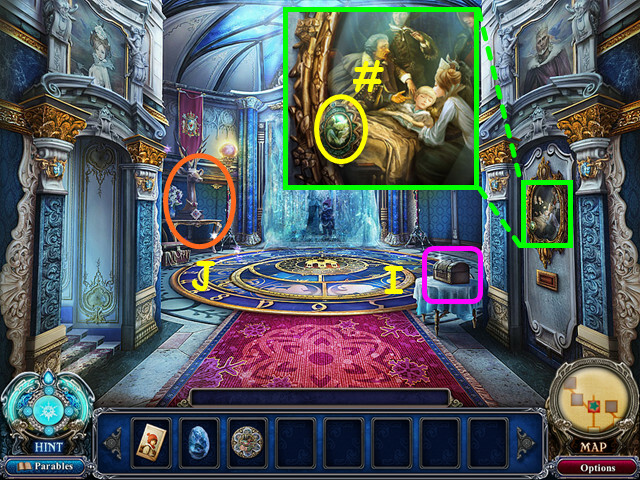 Look at the compartment behind the portrait and take the 1/4 JEWEL COLLECTION (I). 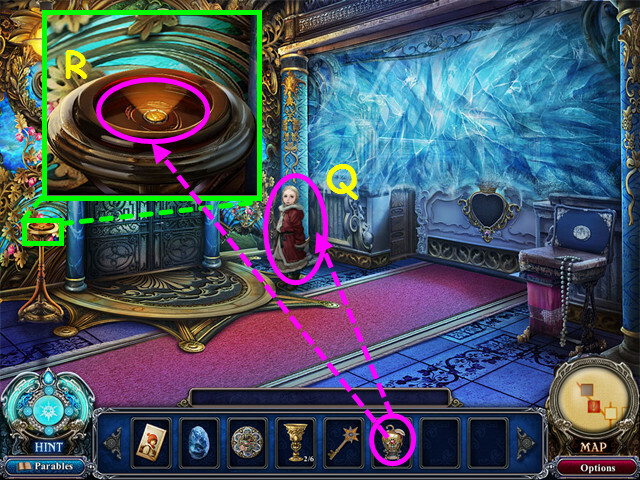 Look at the case, place the CRYSTAL COIN in the niche then select the area for a mini-game (J). Press a gold button in the center (K) to open the 3 nearest circles; only 3 circles can be open at a time. Click on 2 tails to swap positions and move the tails to the correct animal; the animal will light up when correct. The solution is shown here with all the circles open (L). Press the button behind the panel. 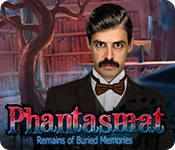 Look in the casket at the boy’s hand (M). 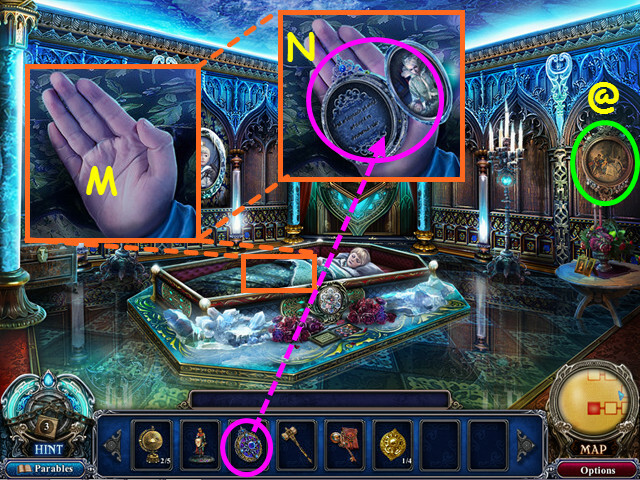 Place the SILVER PENDANT into the hand (N). Select the painting as the 15/20 Cursed Object (@). Walk down twice then talk to the guide. 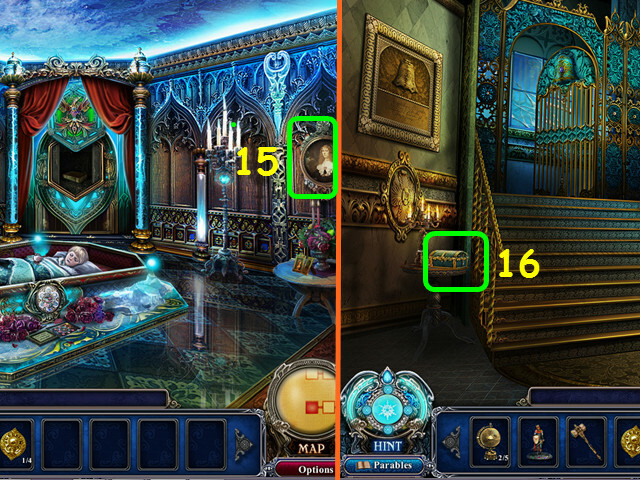 Return to the palace entrance and select the statue on the right for a HOS. You will earn the PRINCESS FIGURINE. Enter the palace and walk to the left. 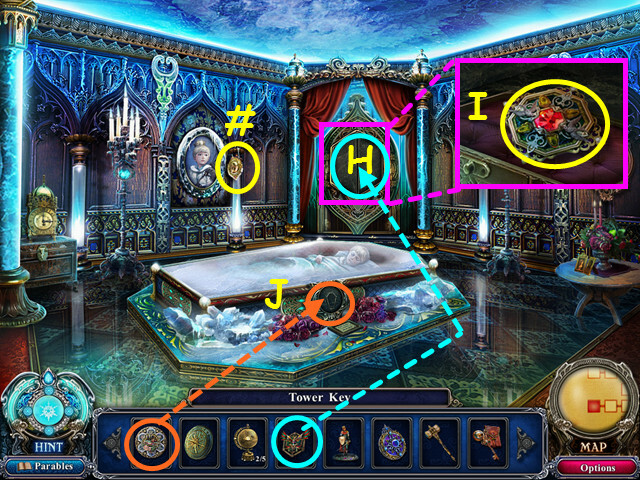 Look at the tower door and use the TOWER KEY on the lock (O). Note the jewelry box (#). Note the closed panel (P). Look at the display on the right for a HOS (Q). You will earn the 2/4 JEWEL COLLECTION. Pull the switch in the panel, then walk up the stairs. 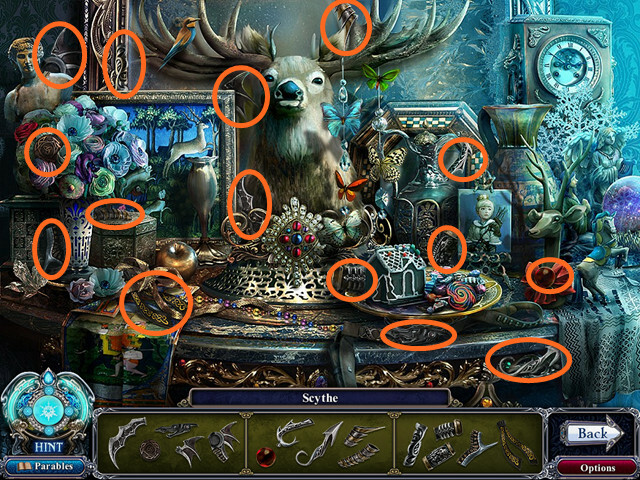 Select the console for a mini-game. 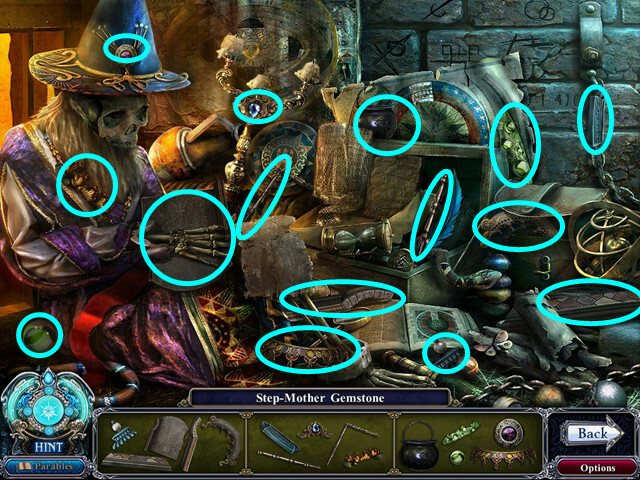 Press all the sequences of red buttons to light up the picture; pressing one button will make others appear. Press the buttons in this order: A-B-C, A-B-D, A-E-F, A-G-H, A-G-I, J-K-L, J-K-M, J-N-O, J-P-Q, J-P-R.
Look where the beast was standing and take the 2/6 SNOW QUEEN TALE PARABLE GEM (#) and the FALSE MIRROR SHARD (A). 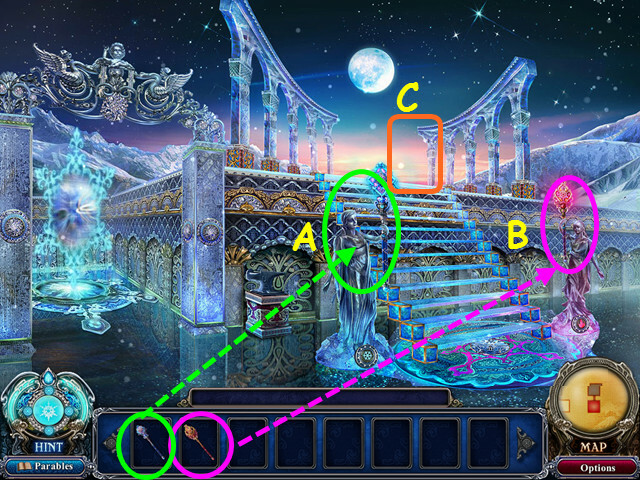 Look at the spot light and see the guide on the ground level (B). Walk down and take the jewelry box as the 16/20 Cursed Object. Look at the display on the right for a HOS. You will earn the ROYAL KEY. 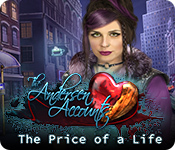 Return to the jail and select the skeleton for a HOS. 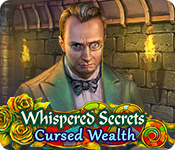 You will earn the STEP-MOTHER GEMSTONE. Return to the throne room. 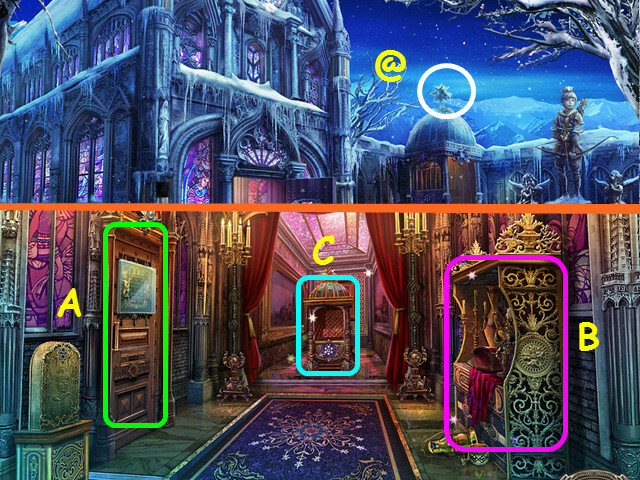 Look at the door on the left and use the ROYAL KEY on the lock. Select the clock as the 17/20 Cursed Object (@). 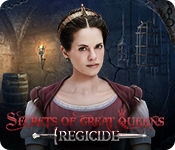 Take the 3/6 SNOW QUEEN TALE PARABLE GEM (#). Place the PRINCE FIGURINE (C) and the PRINCESS FIGURINE (D) on the console. Select the end of the bed for a HOS (F). You will earn the 3/5 GLOBE COLLECTION. Return to the children in the cage. Use the HEAVY SLEDGEHAMMER on the cracked wall (G). Talk to the guide and he will give you the MAGICAL AXE. Walk down twice, then walk left twice. Use the MAGICAL AXE on the vines (H). Select the garden for a HOS (I). You will earn the 4/5 GLOBE COLLECTION. Walk forward through the door. Take the GOLDEN CROWN (J). 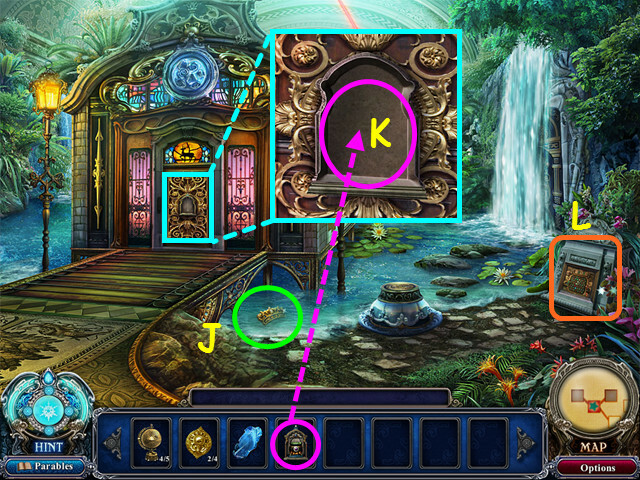 Look at the door and place the STEP-MOTHER GEMSTONE in the niche (K). 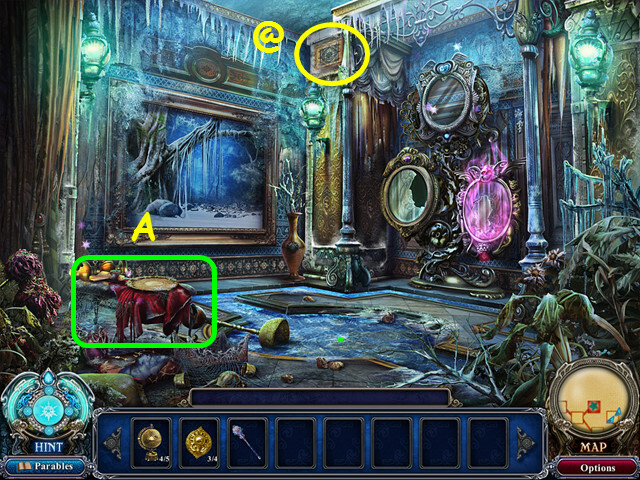 Select the console on the right for a mini-game (L). 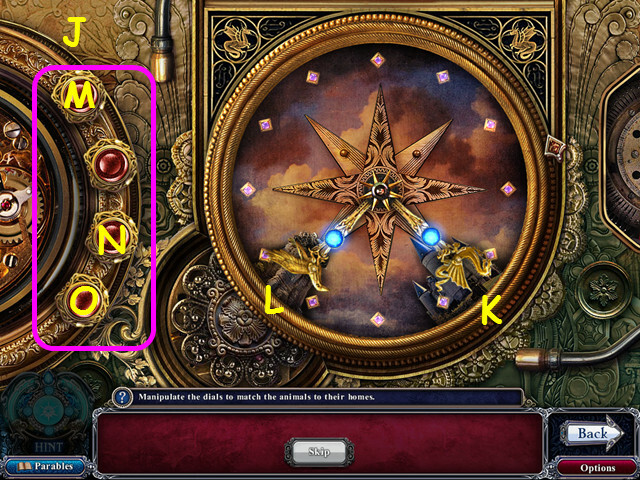 Press the buttons to make a path from the left (M) to the right (N), using the exact number of each colored token shown at the top (O). Take the ICE SCEPTER from behind the panel. Walk forward to enter the godmother room. Select the bottles for the 18/20 Cursed Object (@). 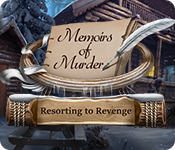 Look at the book and take the 4/6 SNOW QUEEN TALE PARABLE GEM (#). Walk down 5 times to the main hall. Select the floor gem for the 19/20 Cursed Object (@). 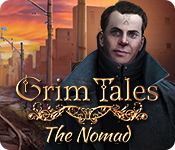 Take the 4/4 TALE of the TWO MIRRORS PARABLE GEM (#). 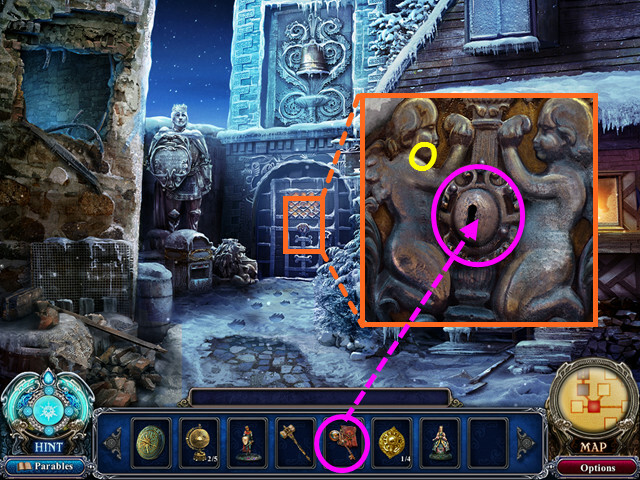 Look at the base of the statue and place the GOLDEN CROWN into the niche (P).Look at the base of the statue again for a mini-game. 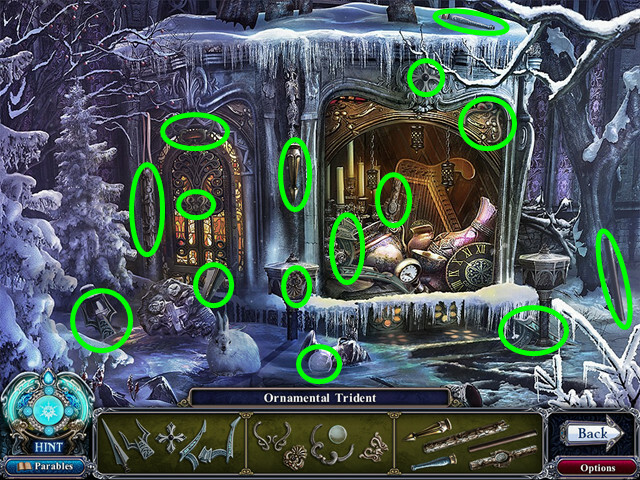 Click on the first circle on the left to open it (A). 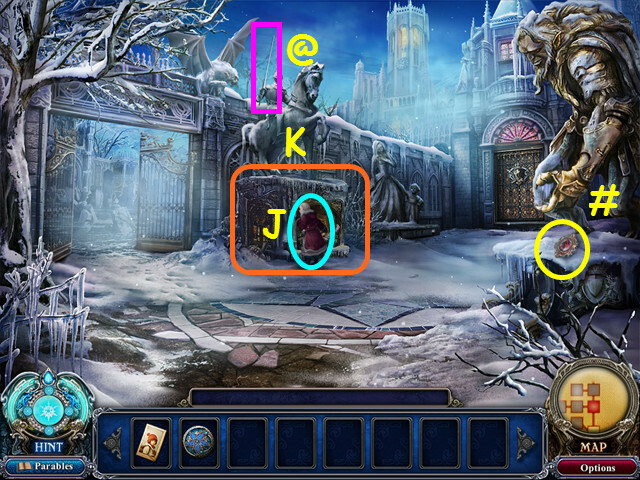 Count the number of hearts in the scene then click on the second circle to set the Roman numeral to ‘V’ (B). 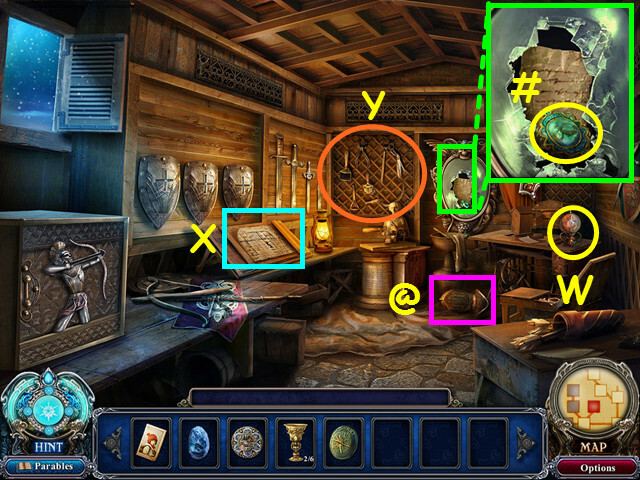 Count the number of castle towers in the scene and set the third circle to show roman numeral ‘IV’ (C). Take the jeweled ‘petals’ from the first 3 circles and place them on the flower (D). Take the shield that appears under the flower and place it under the eagle (E). Click on the right circle to open it then take the wing and place it on the eagle (F). 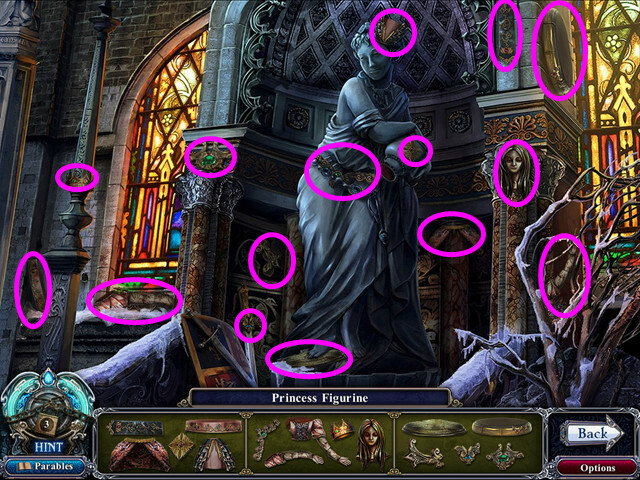 Click on the right figurine until the queen shows (G). Click on the left figurine until the king shows (H); place the wing on the eagle (I). Place the KNIGHT’S SHIELD on the suit of armor (J). 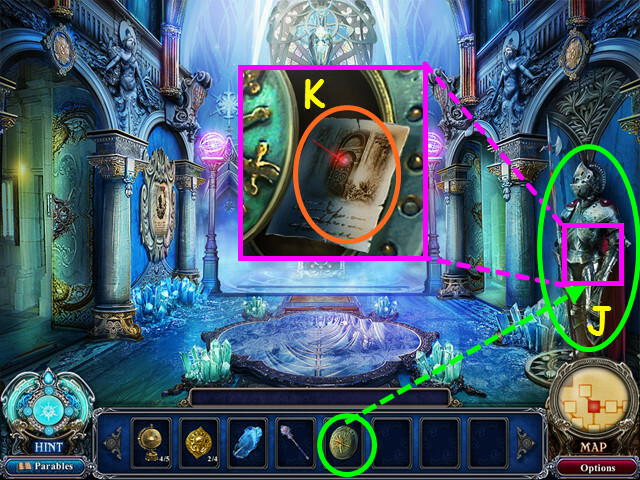 Look at the diagram inside the shield (K). Return to the Godmother room. Select the coal furnace in the rear for a HOS. You will earn the MIRAGE STATUE. 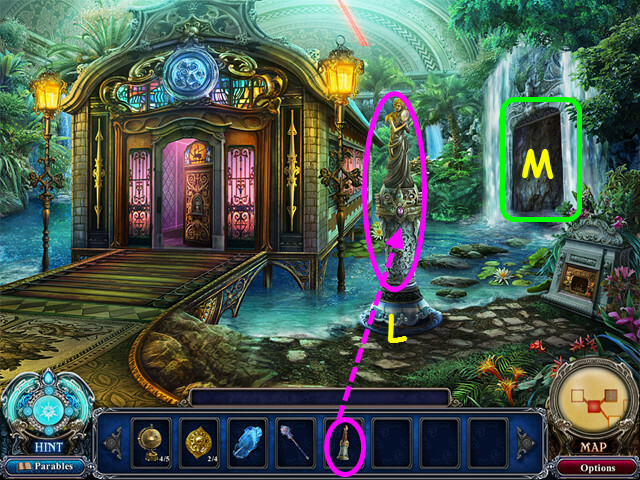 Place the MIRAGE STATUE on the pedestal (L). Enter the mirage room (M). 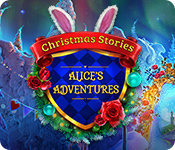 Take the 5/6 SNOW QUEEN TALE PARABLE GEM (#). 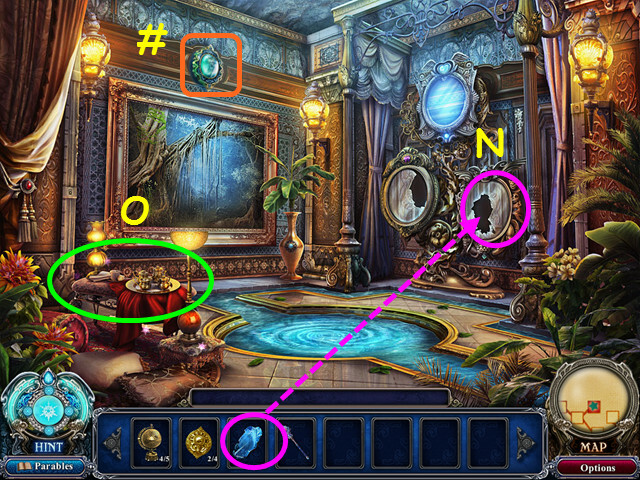 Place the FALSE MIRROR SHARD into the lower right mirror (N). Select the bench for a HOS (O). 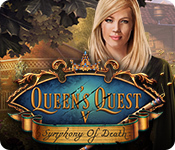 You will earn the 3/4 JEWEL COLLECTION. 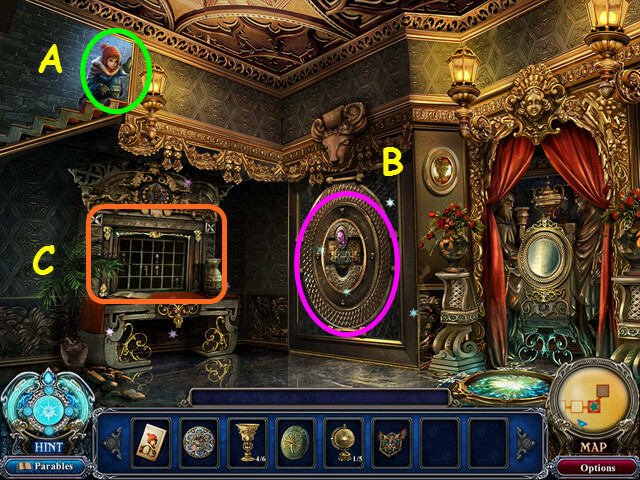 Select the lower right mirror. 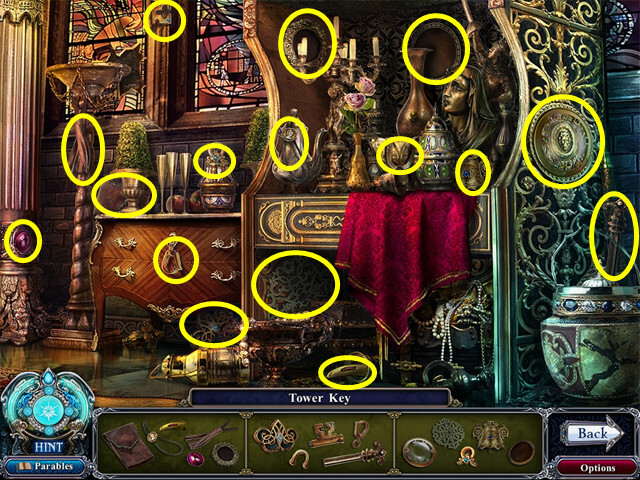 Select the top of the pillar for the 20/20 Cursed Objects (@). Select the bench for a HOS (A). You will earn the 4/4 JEWEL COLLECTION. 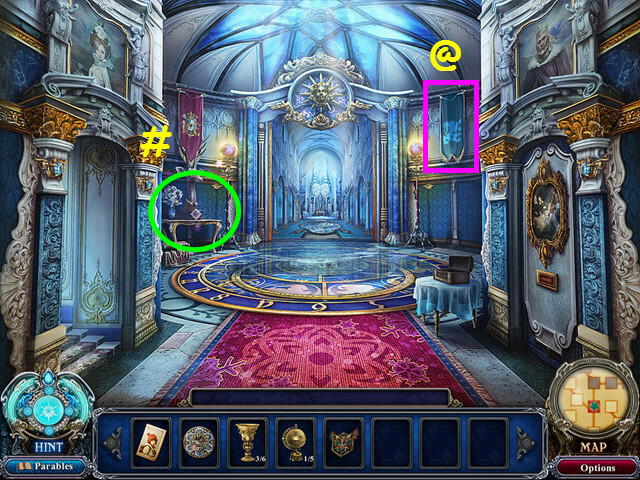 Return to the treasure room and look at the Prince on the right for a mini-game. 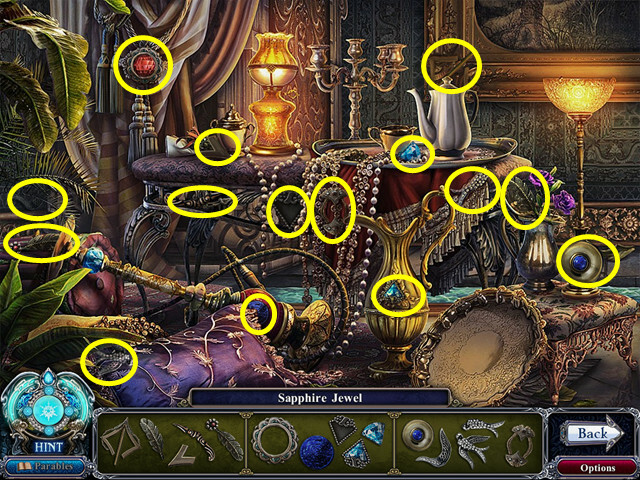 Place the jewels in the correct location; click on two jewels to swap positions. 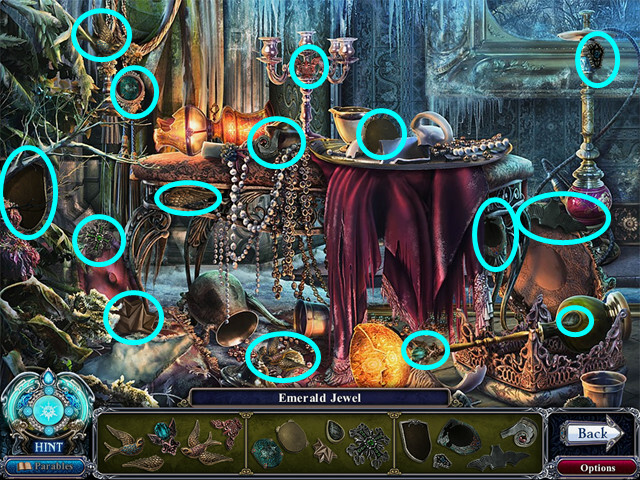 Hover your mouse over a jewel to see the name, then find the similarly themed base. The solution is shown here (B). 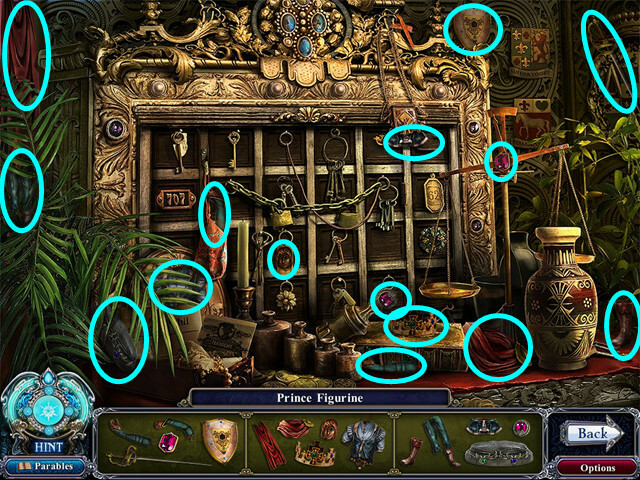 Select the area below the prince for a mini-game. 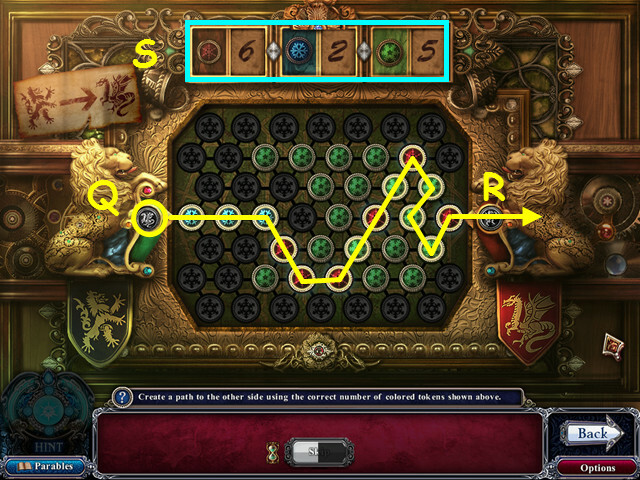 Press the buttons to make a path from the left (C) to the right (D), using the exact number of each colored token shown at the top (E). Take the ANCIENT GLOBE and read the parchment from behind the panel. Exit the room and select the desk for a HOS. You will earn the FIRE SCEPTER. 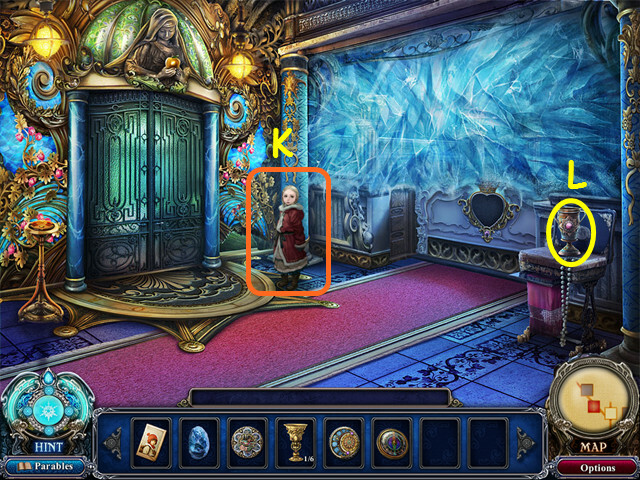 Look at the display case and take the 6/6 SNOW QUEEN TALE PARABLE GEM (#). 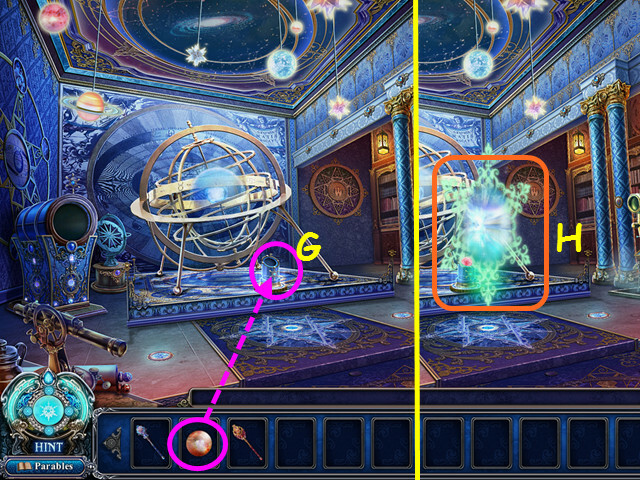 Enter the Astronomy room and select the device on the right for a HOS. You will earn the 5/5 GLOBE COLLECTION. 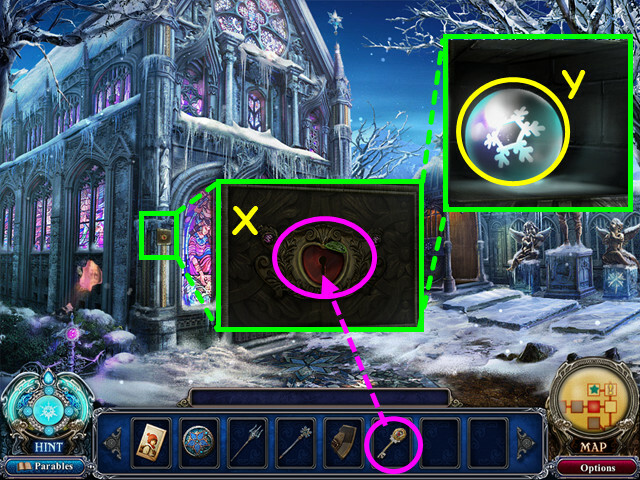 Select the device on the left for a mini-game. 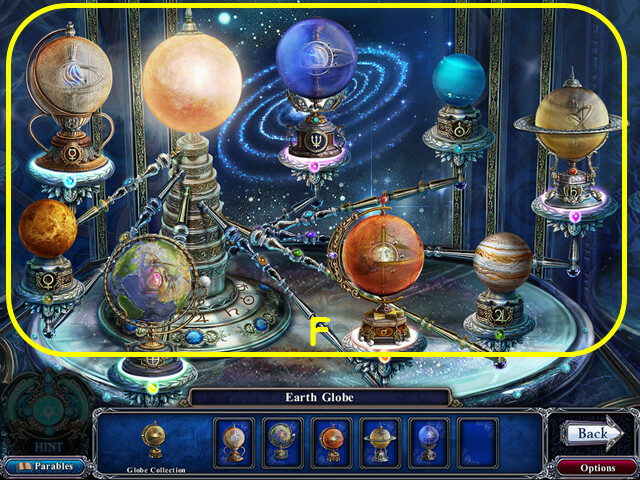 Place the globes in the correct location; click on two globes to swap positions. 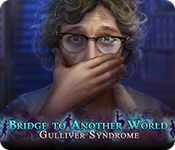 Hover your mouse over a globe to see the name, then find the similarly themed base. The solution is shown here (F). Place the ANCIENT GLOBE onto the stand (G). 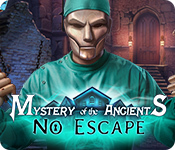 Use the ICE SCEPTER on the left statue (A). 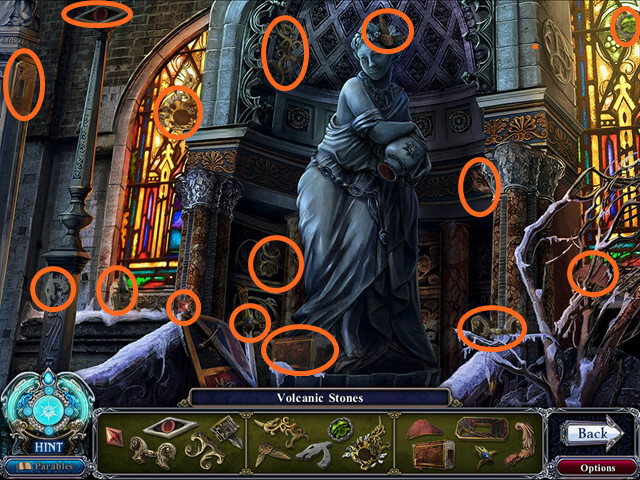 Use the FIRE SCEPTER on the right statue (B). Walk up the stairs (C). After the cut-scene, walk down once. Talk to the King (D). Select the statue on the right for a HOS. You will earn the VOLCANIC STONES. Walk left to enter the armory booth. Select the chest for a HOS. You will earn the FREEZING SAPPHIRE. Return to the bedroom and select the end of the bed for a HOS. You will earn the IMMORTAL OAK HANDLE. Return to the godmother room and select the coal stove for a HOS. You will earn the FIERY GEMSTONE. 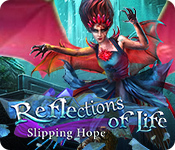 Walk to the Mirage cave; click on the mirror to select the frozen world, and select the bench for a HOS. You will earn the WAND OF MENDING. Return to the Astronomy room and enter the portal. 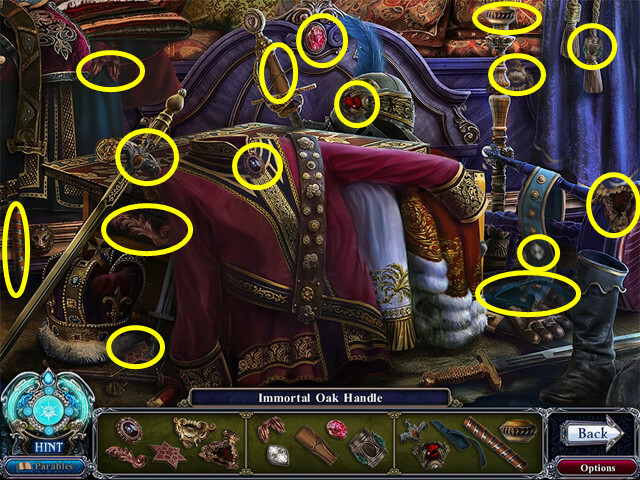 Give the WAND of MENDING, the FIERY GEMSTONE, the IMMORTAL OAK HANDLE, the FREEZING SAPPHIRE, and the VOLCANIC STONES to the King (F). Take the SACRED BLACKSMITH MALLET (G). Use the SACRED BLACKSMITH MALLET on the mirror 3 times (H). Congratulations! 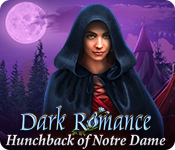 You have completed Dark Parables: Rise of the Snow Queen Standard Edition! 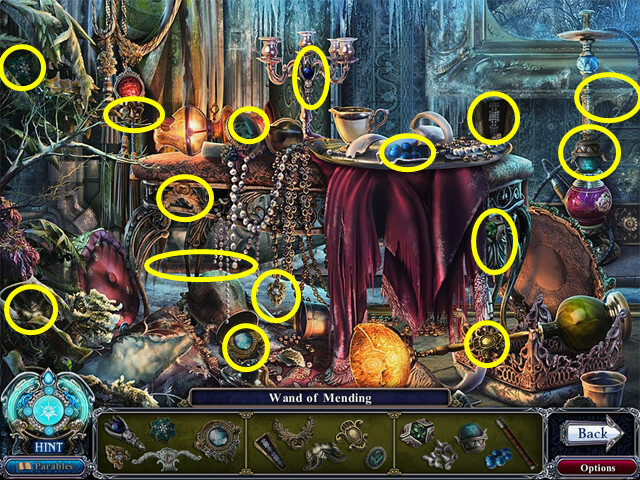 There are 20 morphing Cursed Objects throughout the game. Not all Cursed Objects will be active the first time you see them; some require a certain action or chapter to activate. 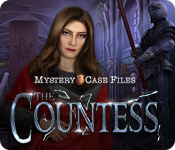 The Cursed objects are listed in the approximate order you will find them. 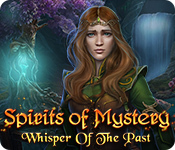 Finding Cursed objects will increase the speed the hint meter recharges. The 1st Cursed Object is found in the front garden; it is the knight’s sword (1). 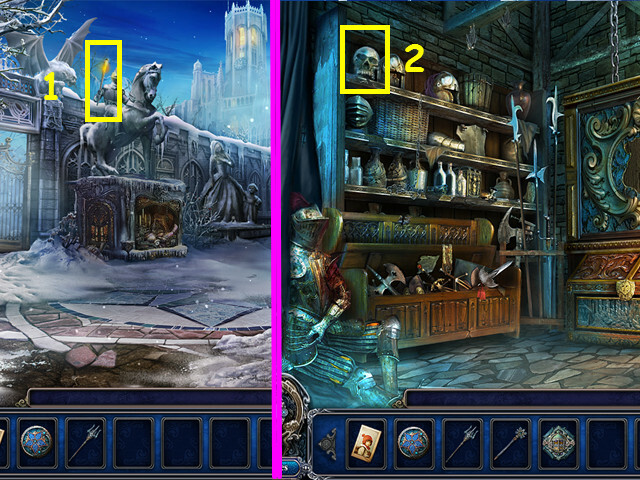 The 2nd item is the skull/helmet found in the booth armory (2). The 3rd is found in the crypt; it is the stained glass on the left (3). The vase of flowers in the main hall is the 4th cursed object (4). The ringed planet is your 5th choice in the astronomy room (5). Select the upper part of the stained glass for the 6th choice (6). The helmet/vase in the workshop is the 7th object (7). 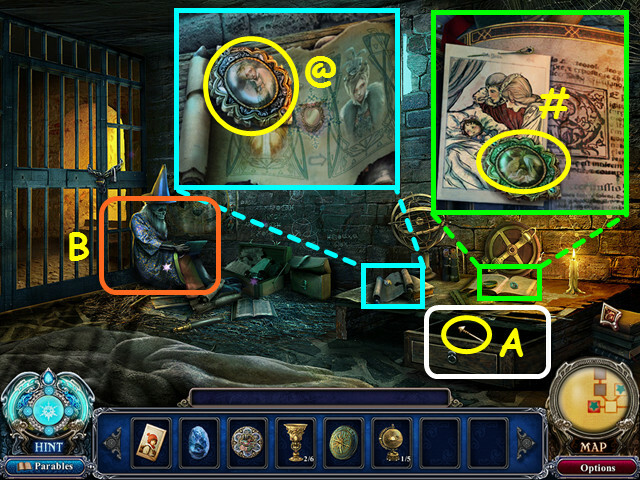 Look at the graffiti on the wall in the jail for the 8th cursed object (8). 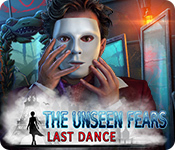 Take the right banner in the left hall for the 9th cursed object (9). 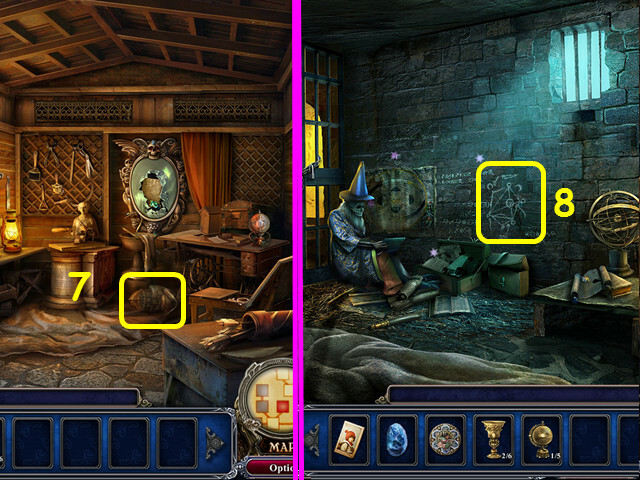 The 10th object is the painting in the jail (10). 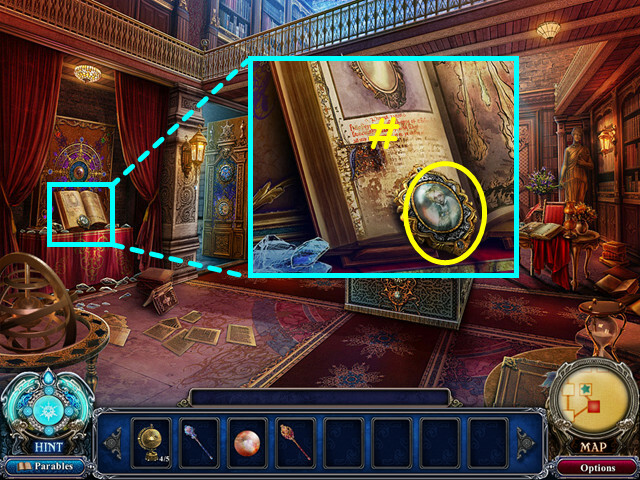 Select the shield/flower over the door in the Treasure room for the 11th Cursed Object (11). 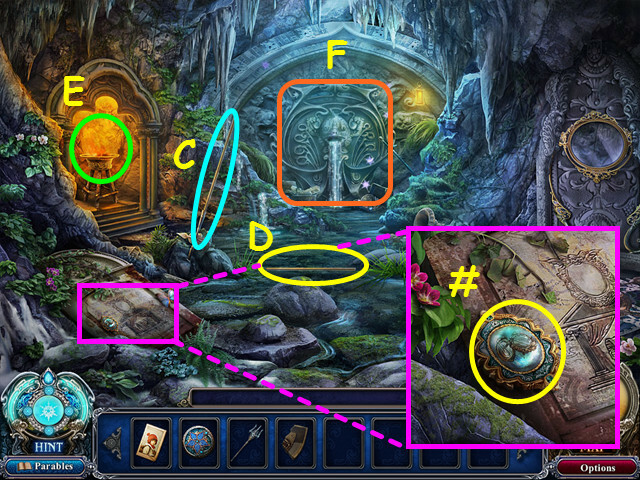 The 12th object is the chest/ flowers out side of the cave (12). 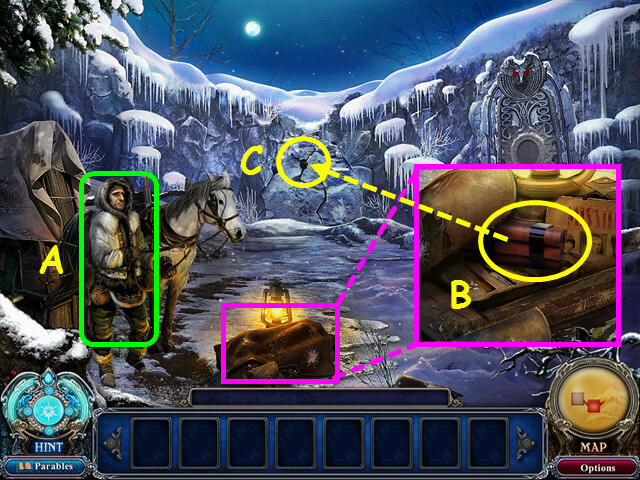 Choose the left end of the caravan cover; take the shield/frog as the 13th Circled object (13). 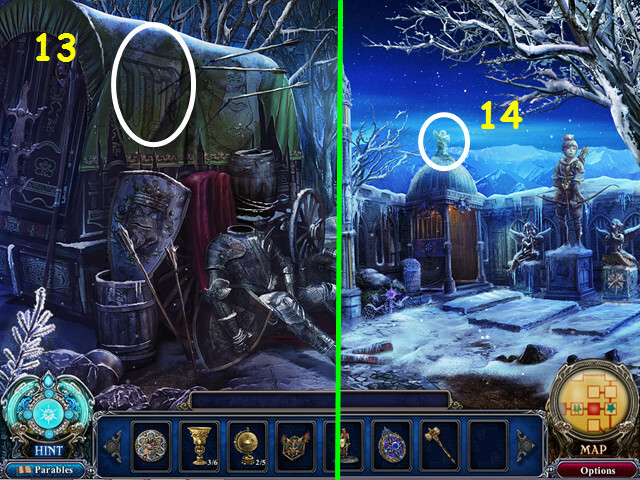 The 14th object is the star over the shed in the graveyard (14). 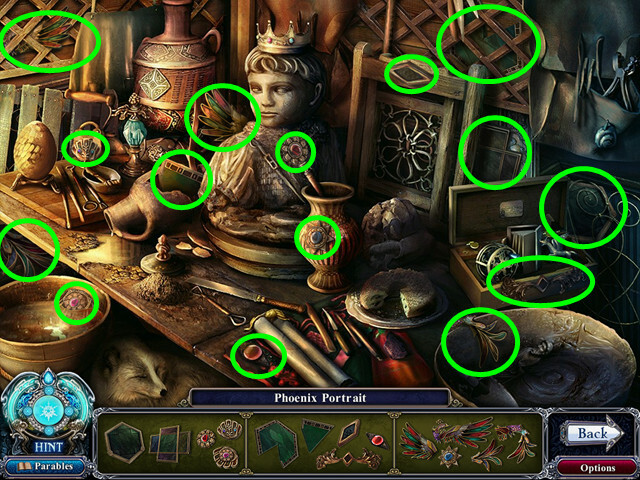 Choose the portrait in the shrine as the 15th Cursed Object (15). The 16th Cursed object is the jewelry box in the tower stairs (16). The clock over the wardrobe in the bedroom is the 17th Cursed Object (17). 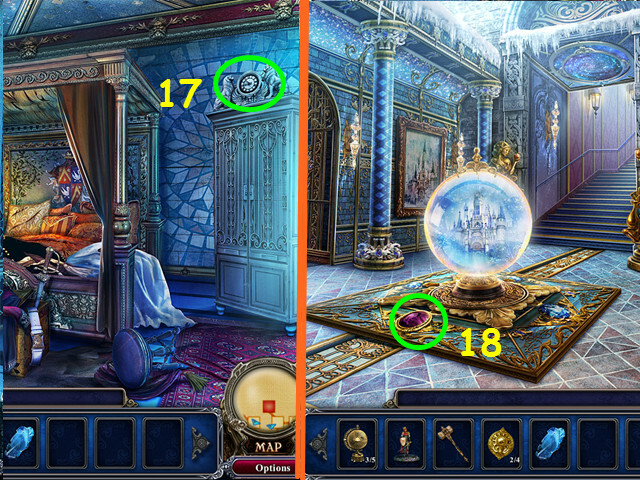 The 18th object would be the gem on the carpet in the main hall (18). 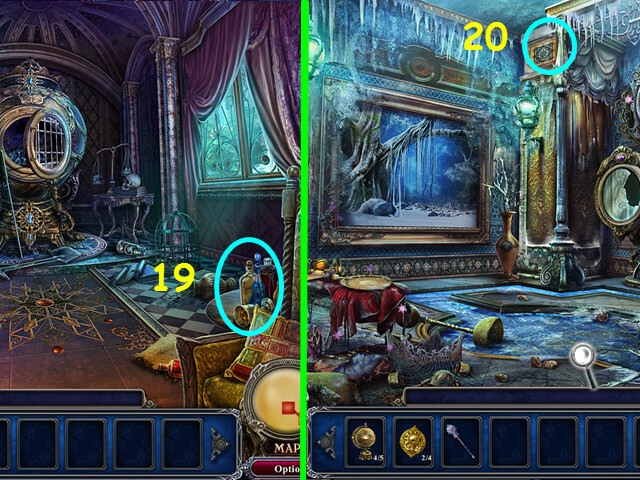 Choose the bottles for the 19th Cursed Object in the Godmother room (19). 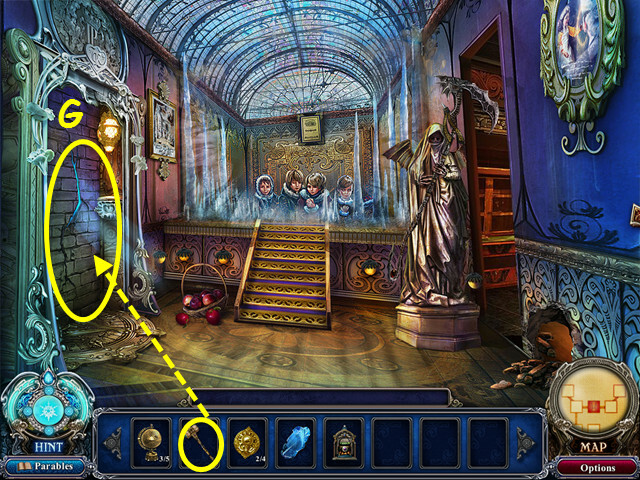 The final cursed object is the panel in the Mirage Room (20).